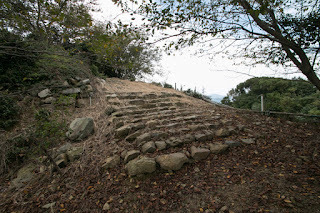 Matsuyama castle (松山城) of Buzen province (eastern part of Fukuoka prefecture) was built over Matsuyama mountain, one of about 160 meter from hillside at the seashore of Karita town, about 10 kilometer southeast from Kita-Kyushu city central. Karita town is an important place of communication where roads and trains pass through narrow path between Nuki mountains and Suo-nada bay. 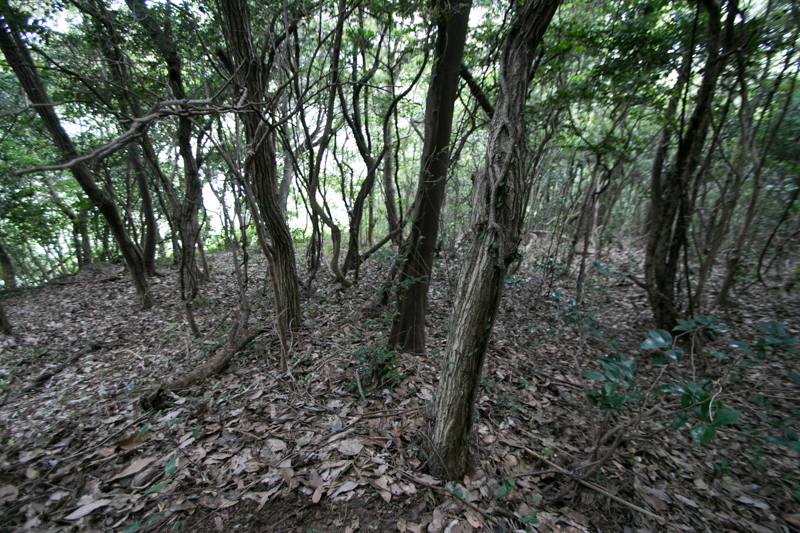 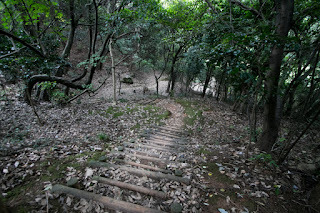 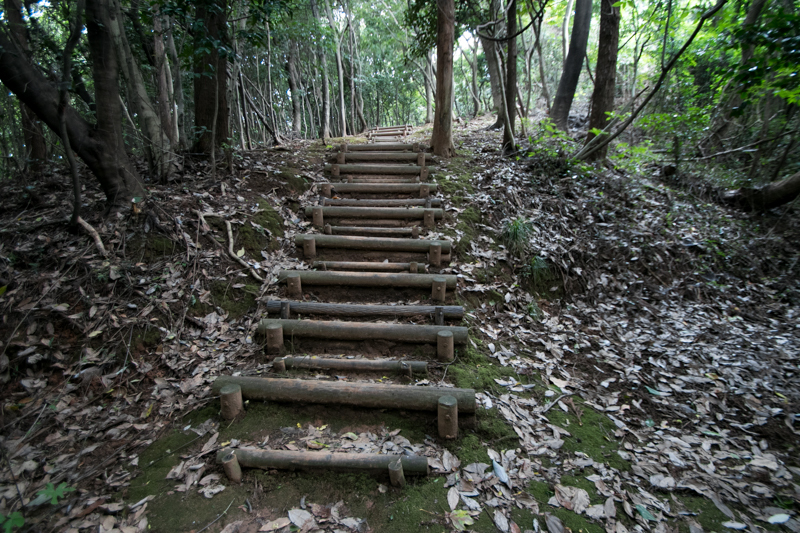 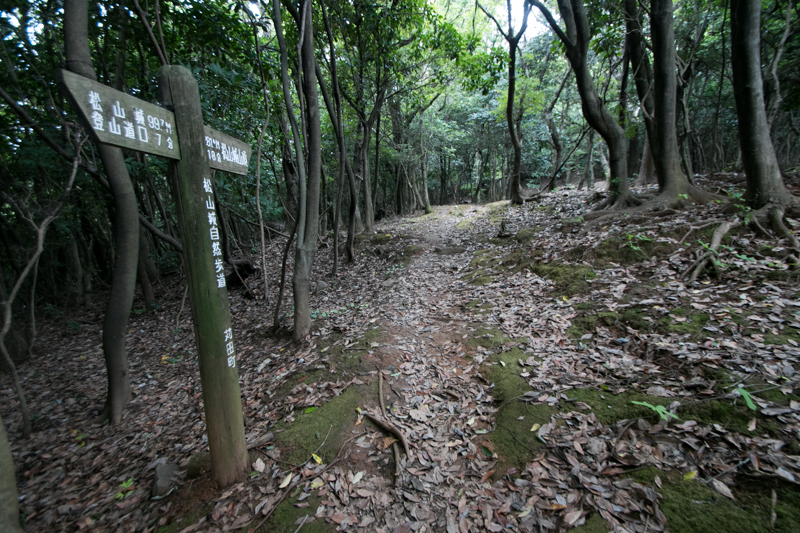 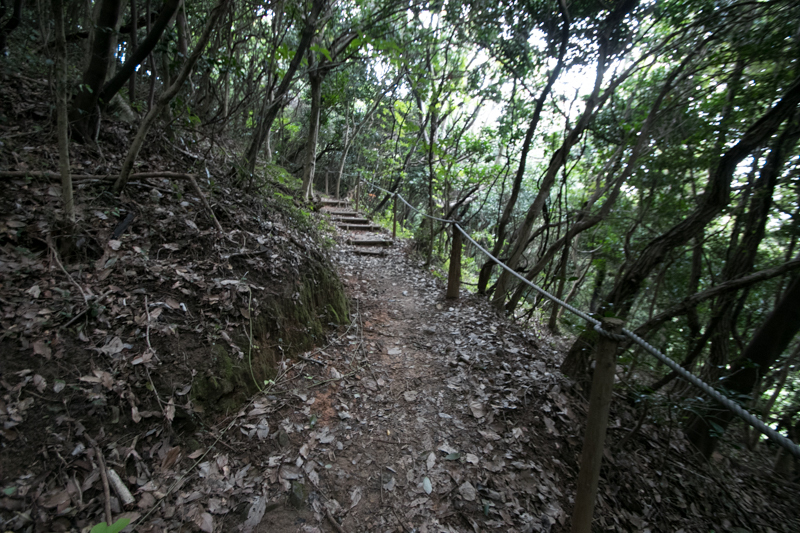 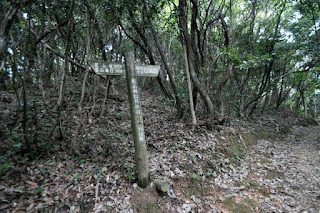 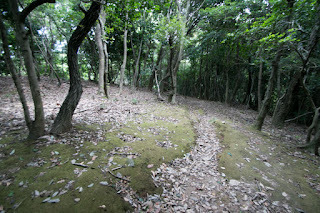 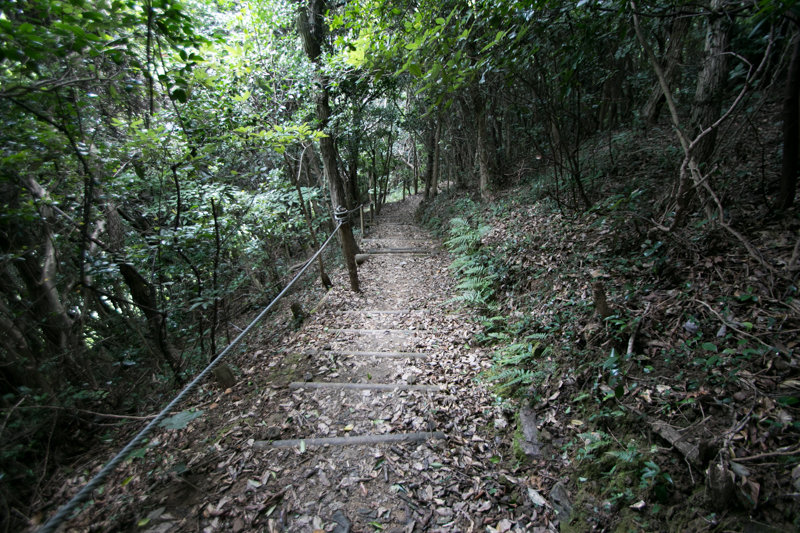 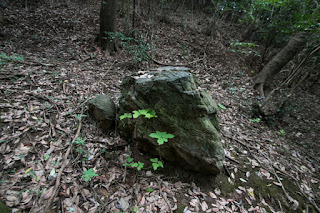 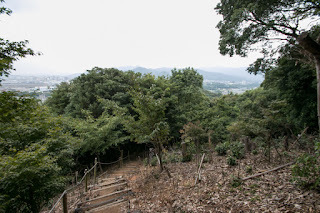 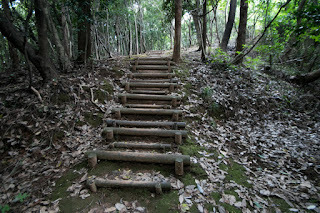 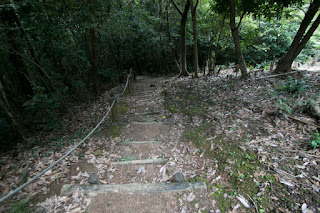 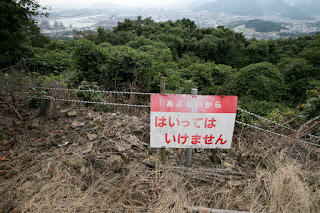 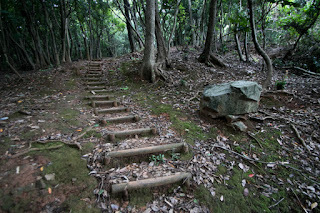 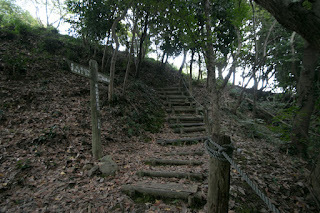 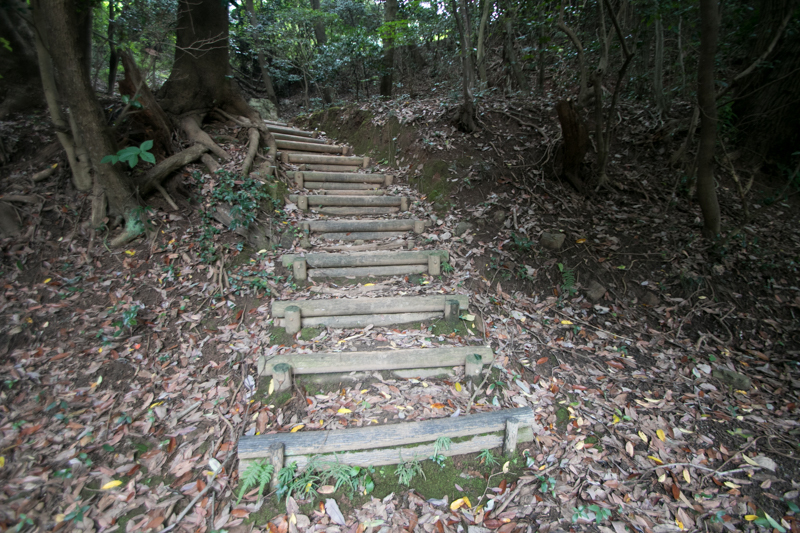 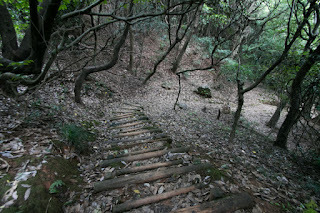 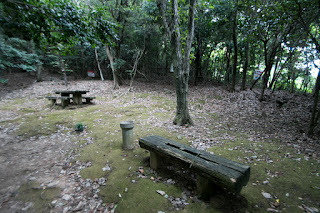 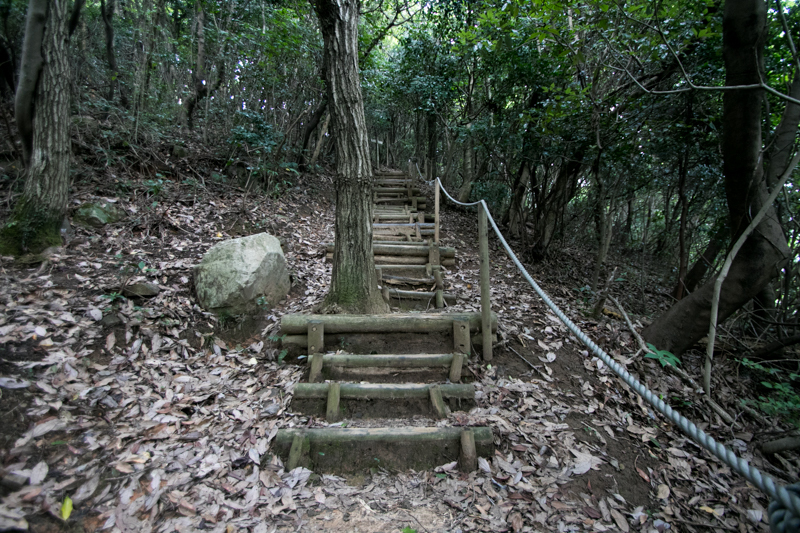 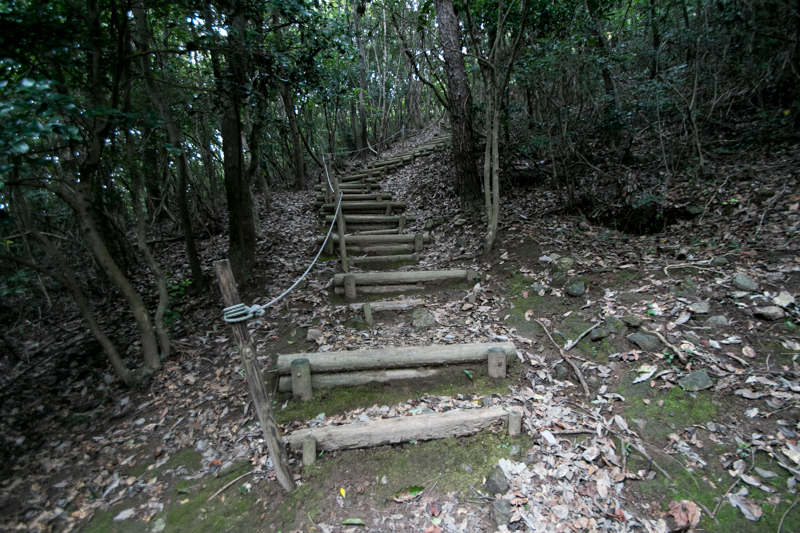 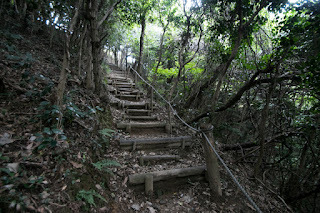 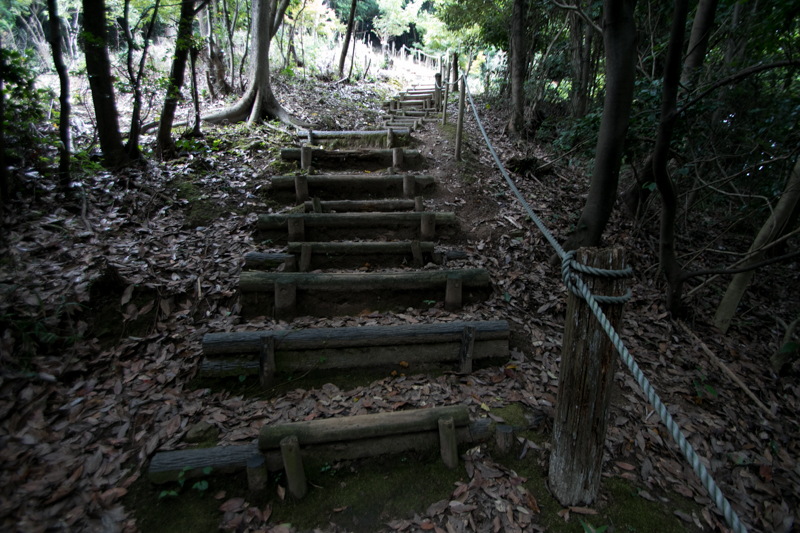 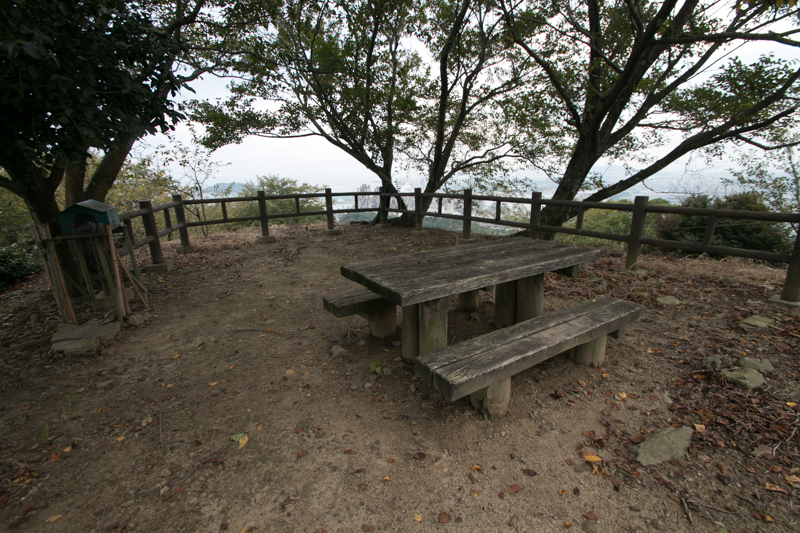 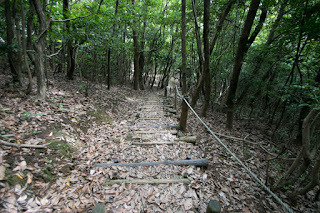 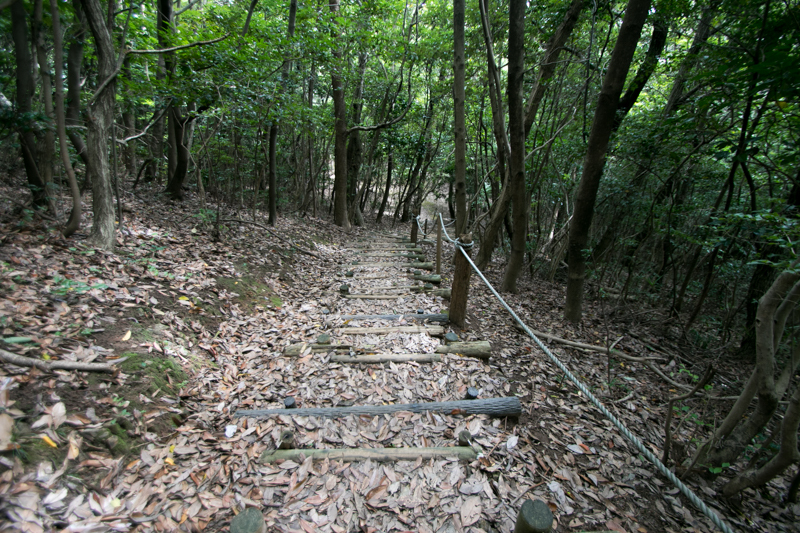 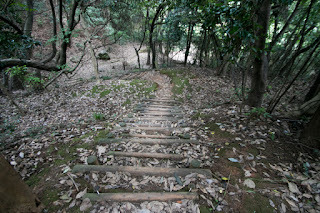 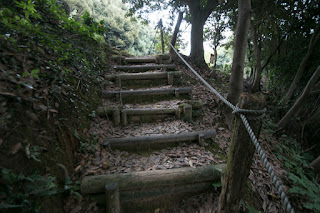 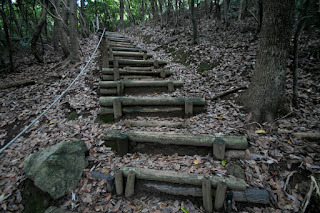 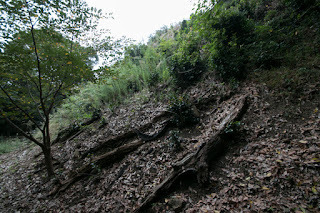 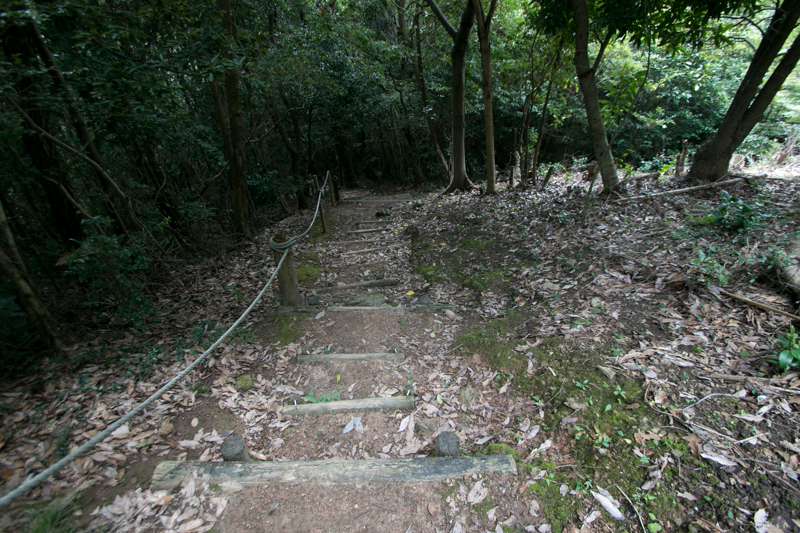 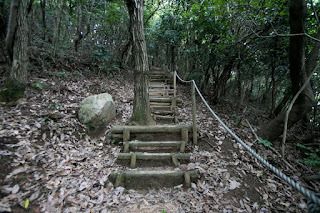 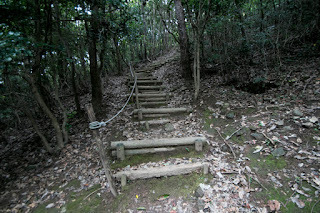 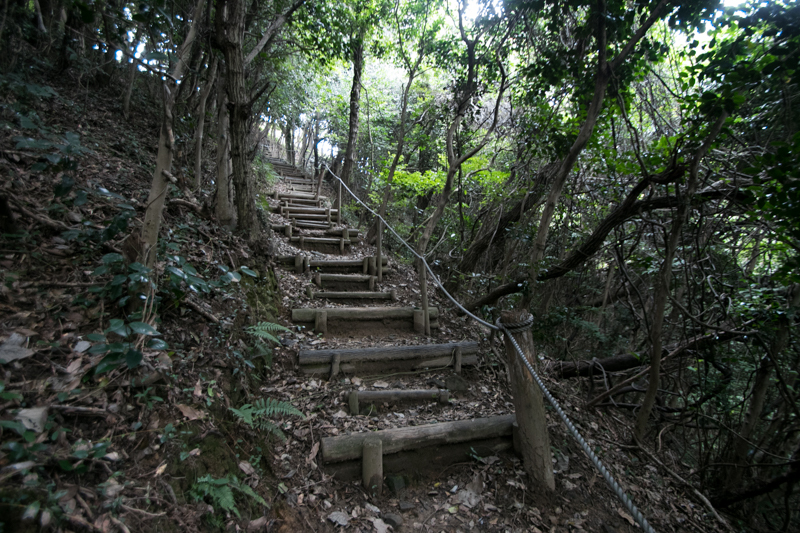 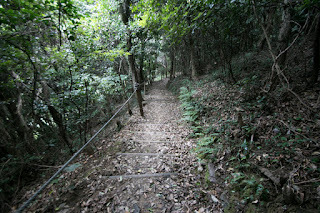 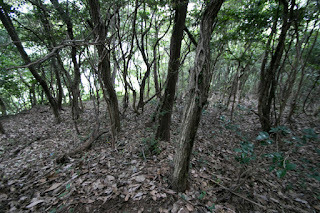 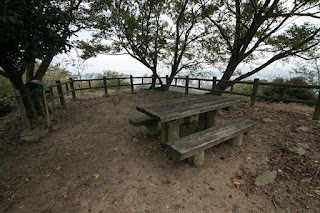 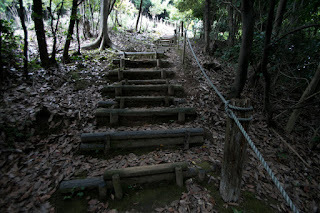 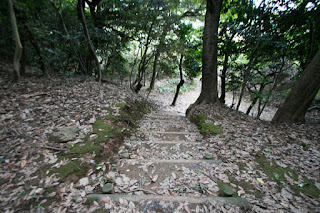 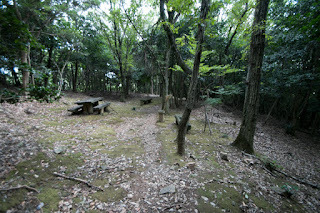 In addition to this strategic location, Matsuyama mountain itself is tactically good point. 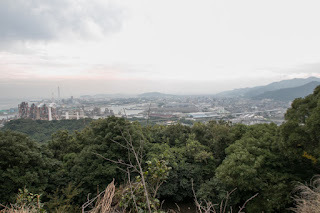 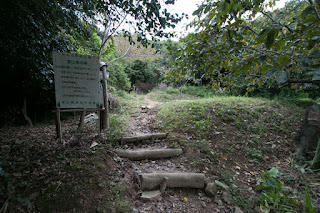 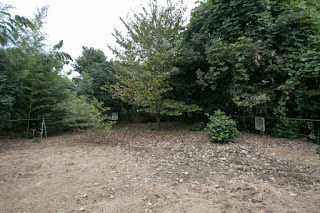 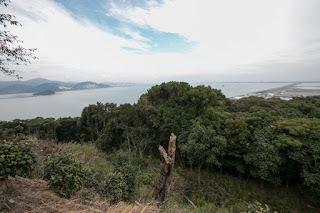 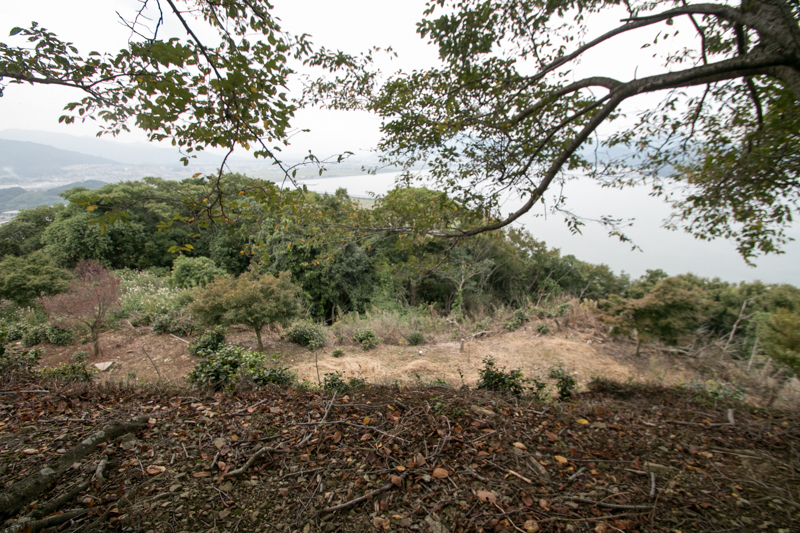 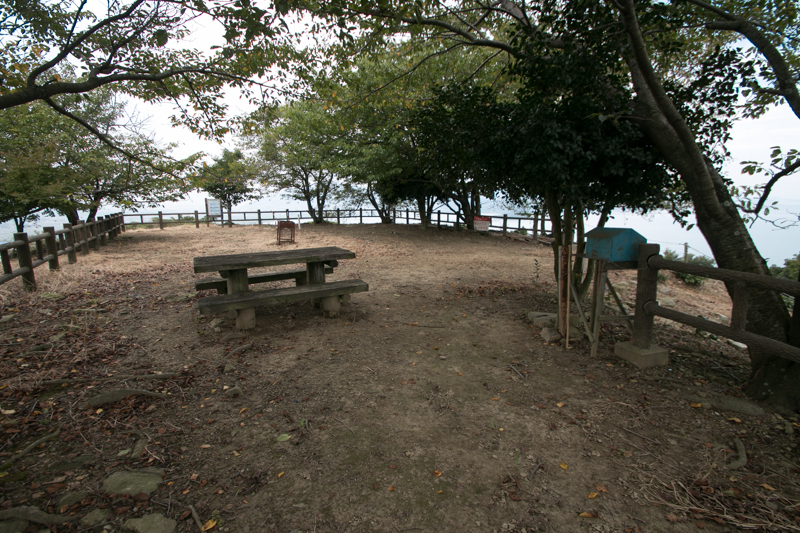 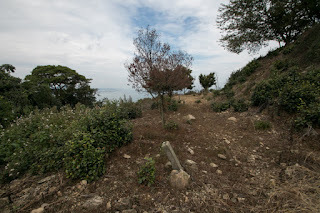 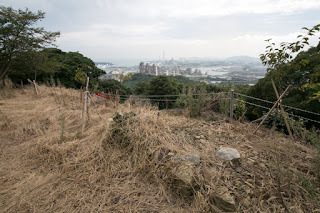 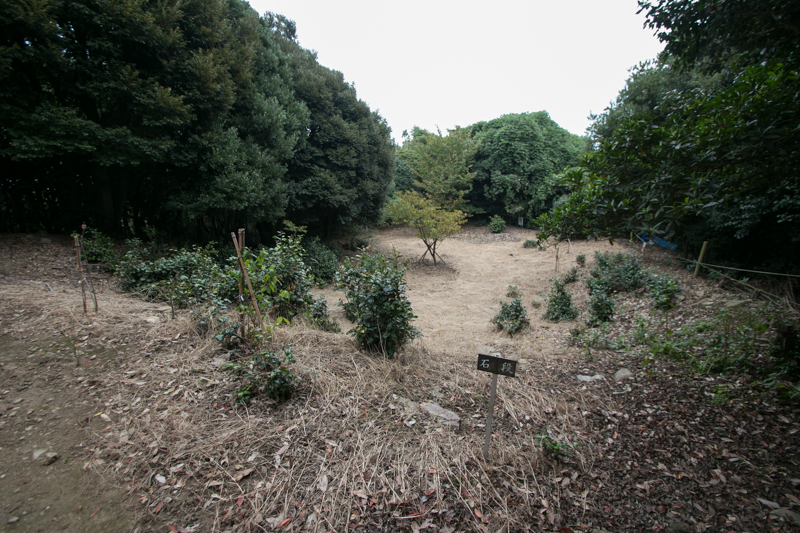 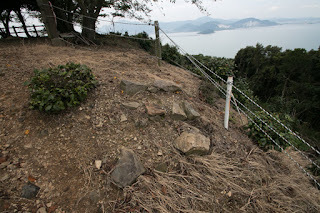 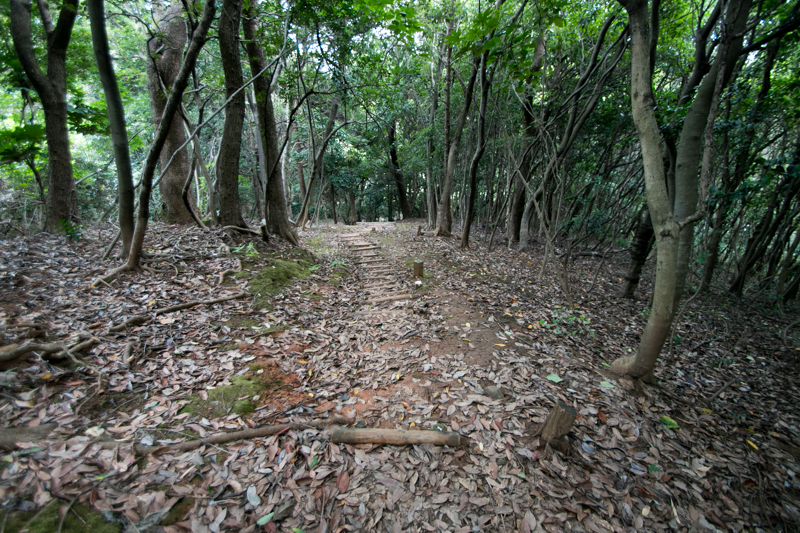 Now it is surrounded by reclaimed land, but formerly it was like an island connected to main land by narrow path and directly faced the ocean. The height of mountain is not so high, but only by defending narrow path it became an impregnable fortress. The mountain has an affordable size with three peaks, and it could contain hundreds of soldiers to keep the castle. 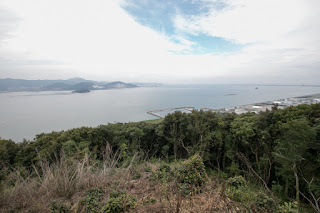 Furthermore, this castle has good perspective over the whole part of Suo-Nada bay, and it was possible to land supplies and reinforcement army by navy in case of besiege. 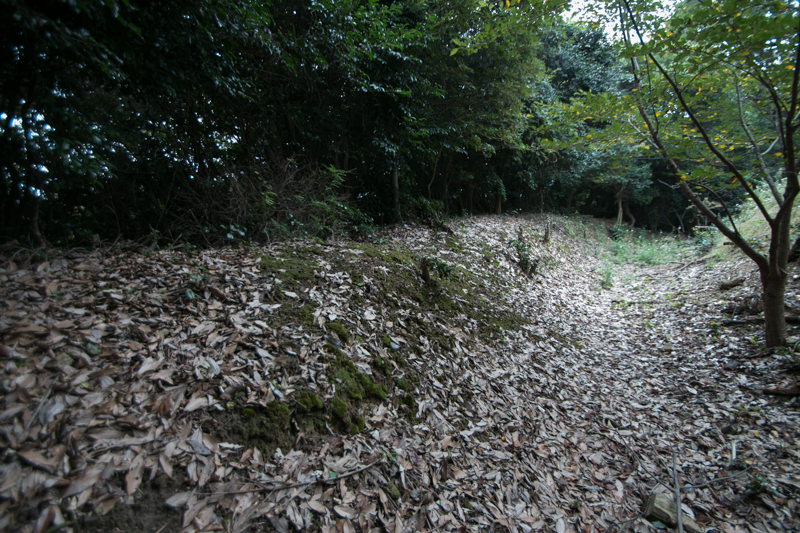 There was no sufficient space to build castle town, but it was an ideal site to place local commander. The origin of Matsuyama castle is unknown but it is said to be built by Hirotsugu Fujiwara (?-740) in 740. 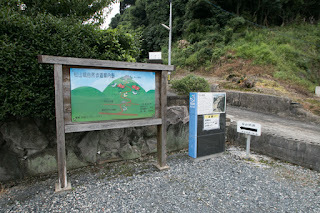 Hirotsugu was the person of central noble Fujiwara clan and appointed as the governor of vice capital Dazaifu city but raised his army against Yamato Dynasty. 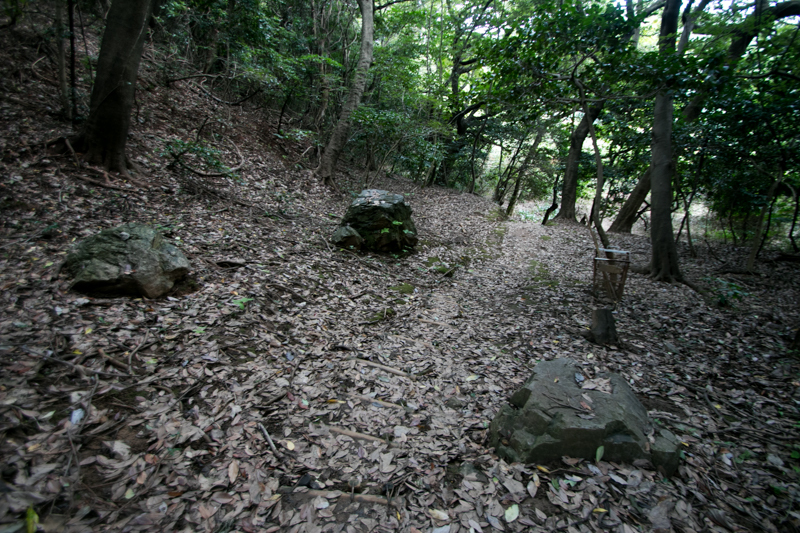 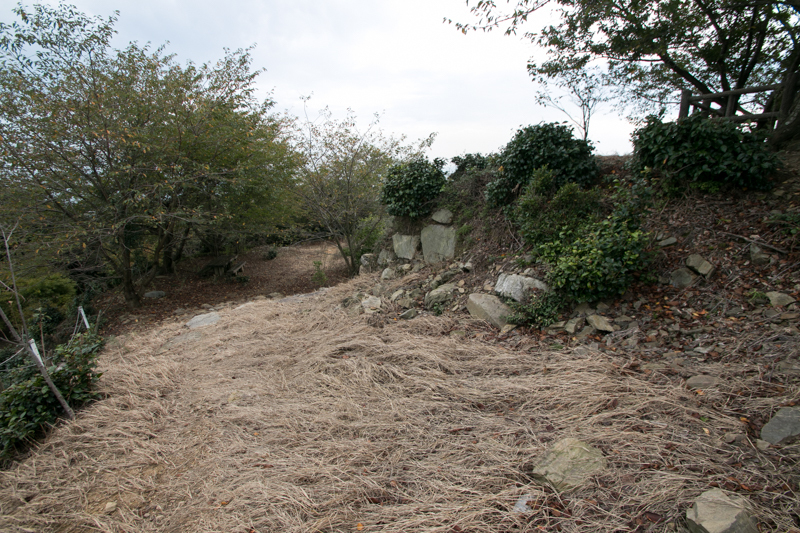 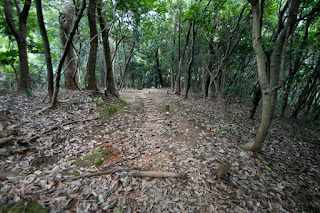 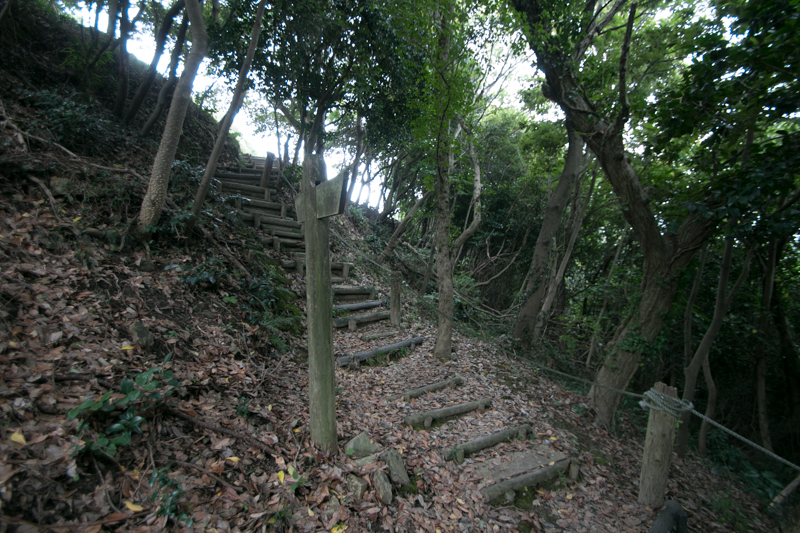 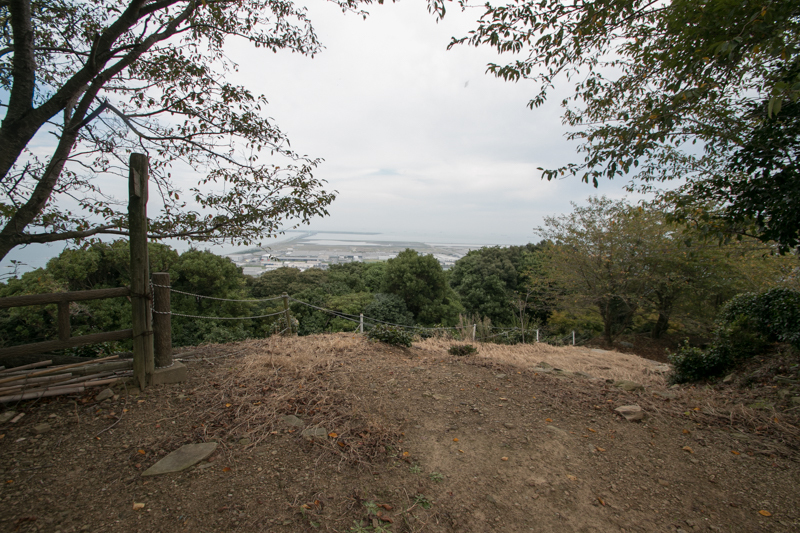 Hirotsugu planned to hold back the Dynasty army at current Kitakyushu city area. 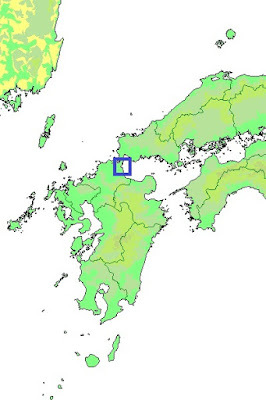 Moji peninsula was the closest point to Honshu main land, but it swift tide was an obstacle for convoys. 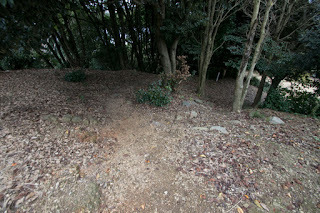 Direct approach to Karita area from Ube area was also expected, thus it might be reasonable for Hirotsugu to build a castle. But Hirotsugu suffered severe defeat at the battle of Itabashi-gawa river and was killed. 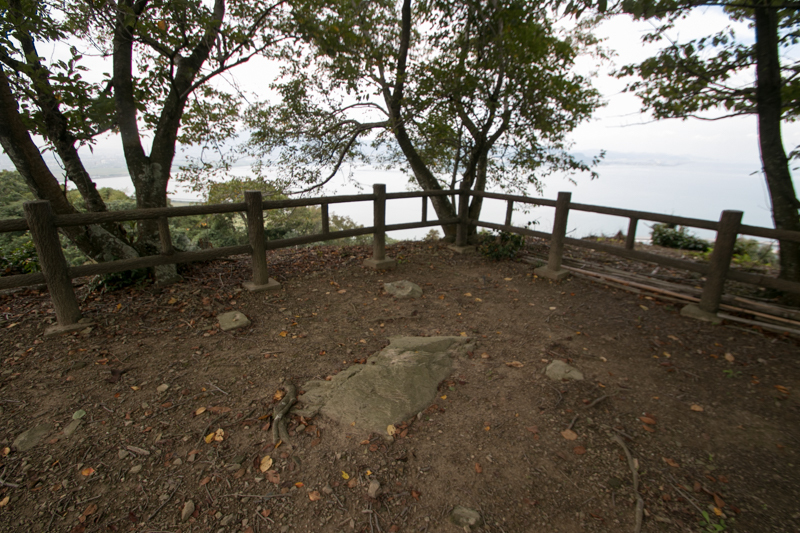 200 years after that, Sumitomo Fujiwara (893-941) also tried to rebel against central government from Seto-Naikai sea and Kyushu island. 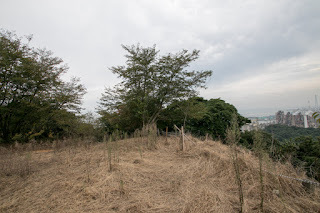 At this time local samurai Kanda clan protected Matsuyama castle against Sumitomo. 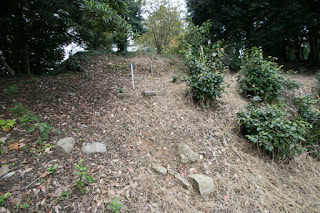 Kanda clan kept Matsuyama castle but was ruined by Yasuyori Taira (1146-1220) under Taira government. After the establishment of Kamakura Shogunate, Matsuyama castle belonged to Utsunomiya clan which was appointed as the governor of Buzen province (eastern part of Fukuoka prefecture). 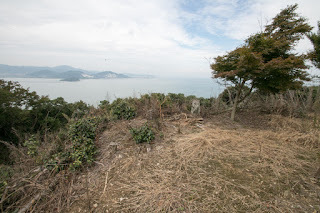 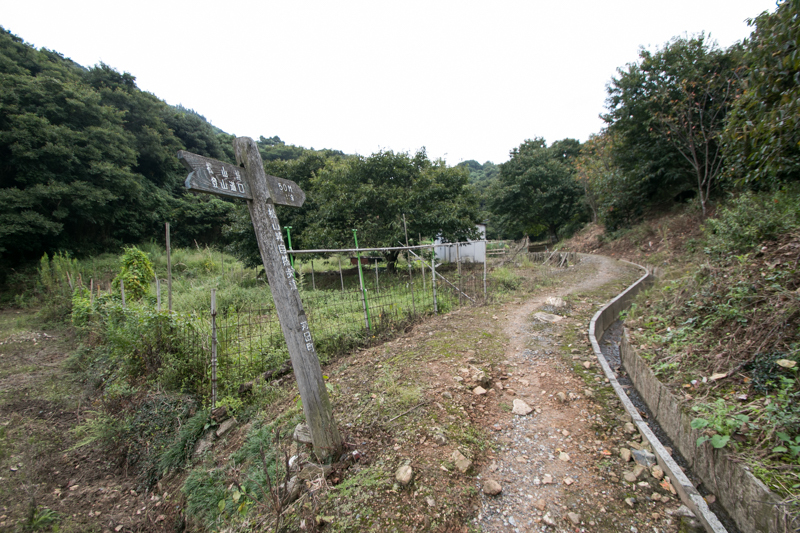 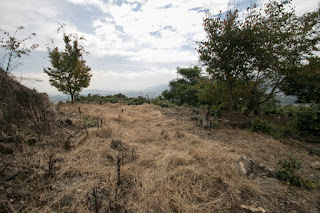 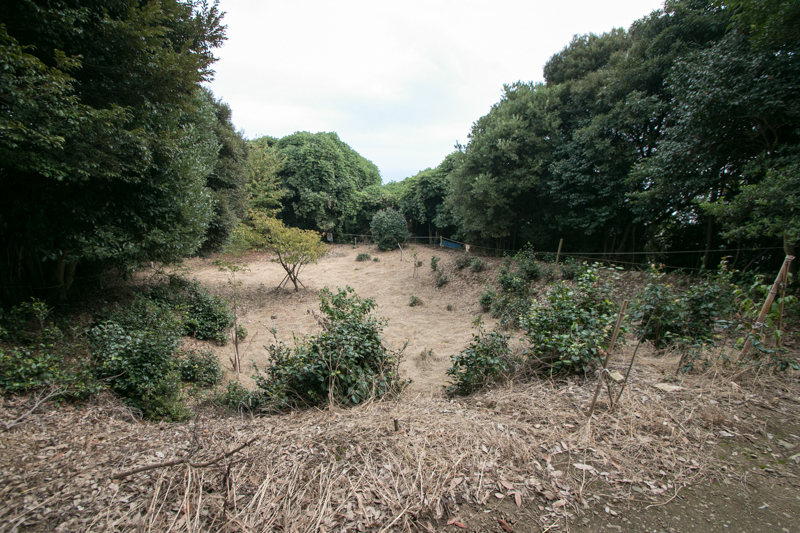 But after the fall of Shogunate, the north part of Kyushu island became the target of struggle between the South Court army and Muromachi Shogunate arny. At the end of 14th century, Ouchi clan which was the strong warlord of Suo and Nagato province (Yamaguchi prefecture) was appointed as the governor of Buzen province. Buzen province became the territory of Ouchi clan, and Ouchi clan placed their important general at Matsuyama castle as a magistrate of Buzen province. 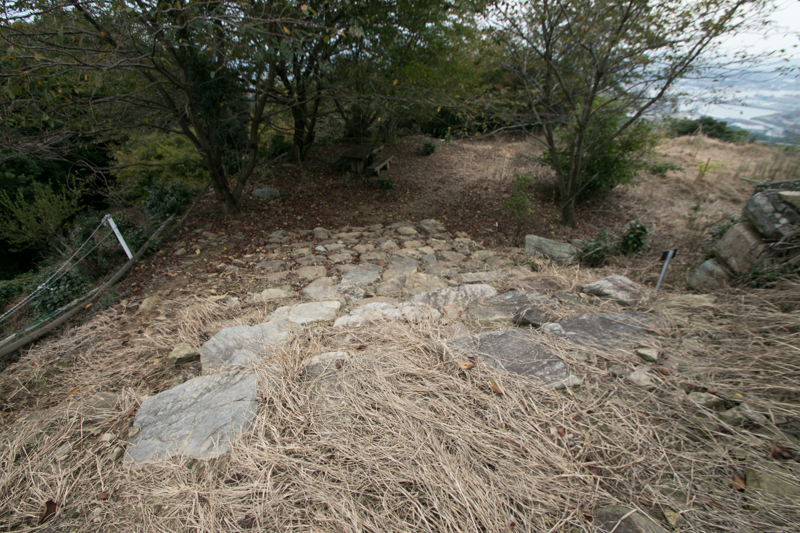 Sugi clan kept Matsuyama castle under Ouchi clan over 150 years, conflicting against Otomo clan which was also a strong warlord of Bungo province (Oita prefecture). But in 1551, Ouchi clan was substantially ruined by a coup d'etat by its general Harukata Sue (1521-1555). 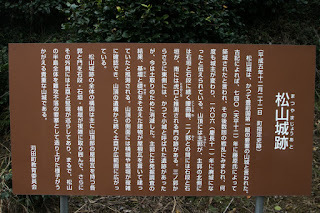 Shigenori Sugi (?-1553), the deputy governor of Buzen province and commander of Matsuyama castle, at first belonged to Harukata and supported his coup d'etat. 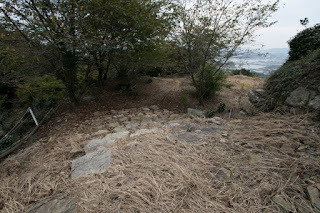 But soon Shigenori broke with Harukata and was killed at Yamaguchi city, and later his son Shigesuke Sugi (?-1557) fell Wakayama castle, the main base of Sue clan, and made revenge of his father. Buzen province which lost their governor became the target of struggle between Otomo clan and Mouri clan, the warlord of Aki province (Hiroshima prefecture) and captured former territory of Ouchi clan. 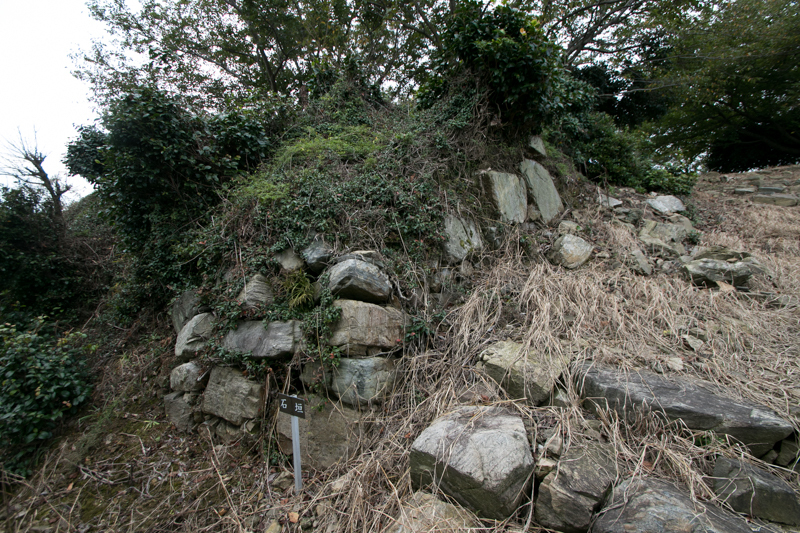 At first Otomo clan once captured Buzen province, but Mouri clan allied with local lord then captured Moji castle and entered to Buzen province. 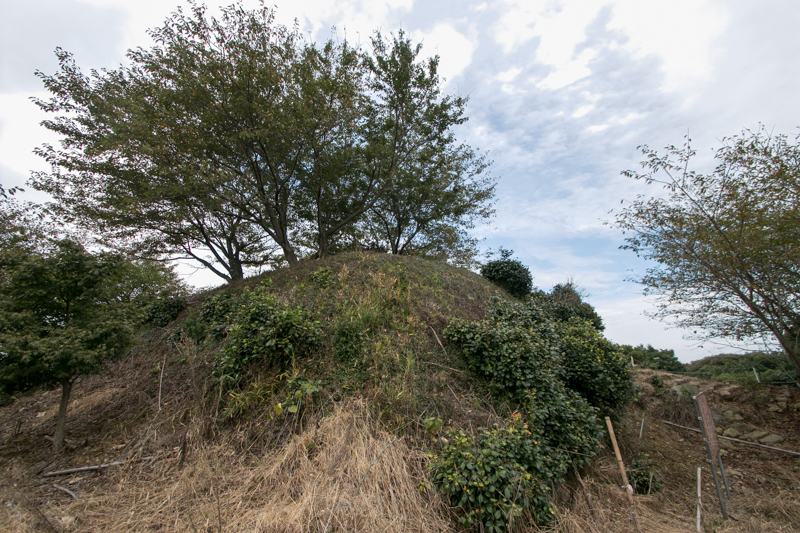 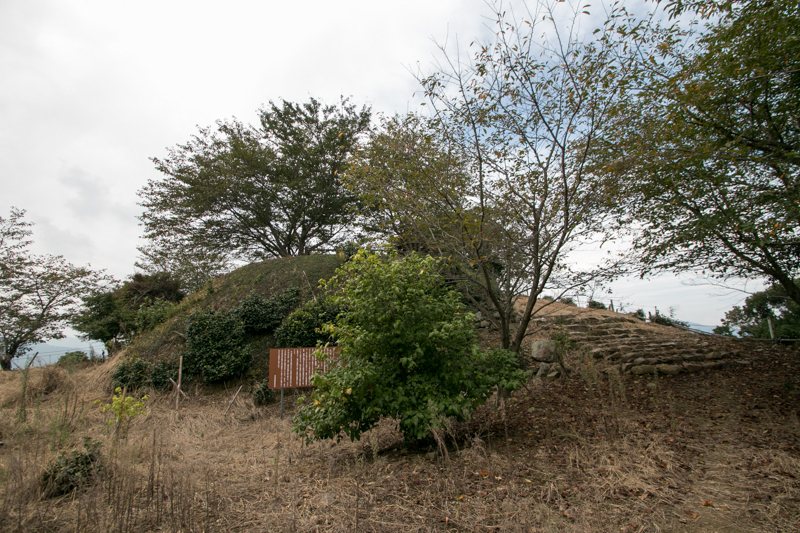 At the fourth battle of Moji castle occurred in 1561, Mouri clan captured Matsuyama castle at the backside of Otomo army and let them retreat. Takakage Kobayakawa (1533-1597), a clever general of Niitakayama castle (Hiroshima prefecture) and third son of their leader Motonari Mouri (1497-1571), entered Matsuyama castle and evaluated as the securest castle over the province. Takakage appointed his important retainer Takashige Amamo (1503-1584) as the commander of the castle. Under the pressure of Otomo clan which aimed north part of Kyushu region, Matsuyama castle was a critical castle to hold back Otomo army and keep safe area from Moji peninsula toward Hakata port, the most important target of Mouri clan. In 1568, utilizing the leave of Akizuki clan and Tachibana clan from Otomo clan, Motonari Mouri made total attack toward Otomo clan at Chikuzen province. 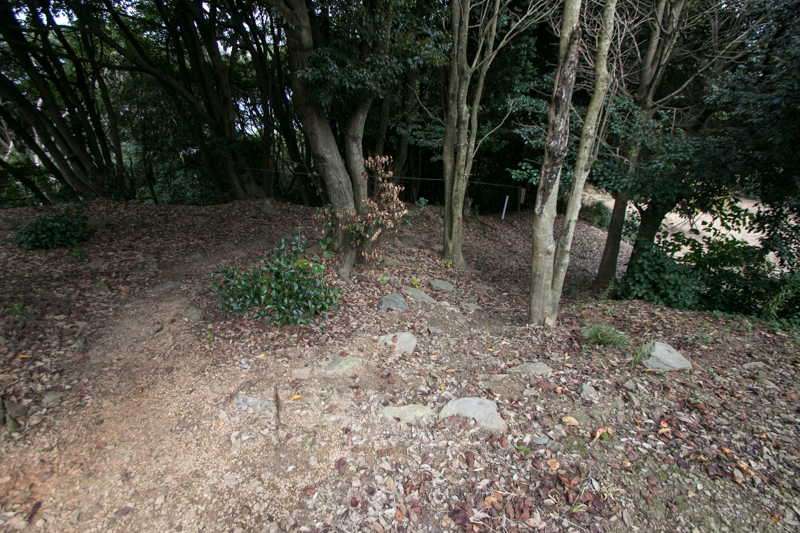 But Otomo army lead by great general Dosetsu Tachibana (1513-1585) broke Mouri army after fierce battle at the battle of Tatarahama in 1569. 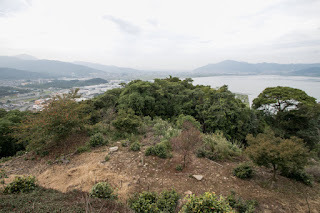 At the same time, Otomo clan supported the person of old power ruined by Mouri clan such as Otomo clan or Amago clan and let them raise at the backside of Mouri territory. 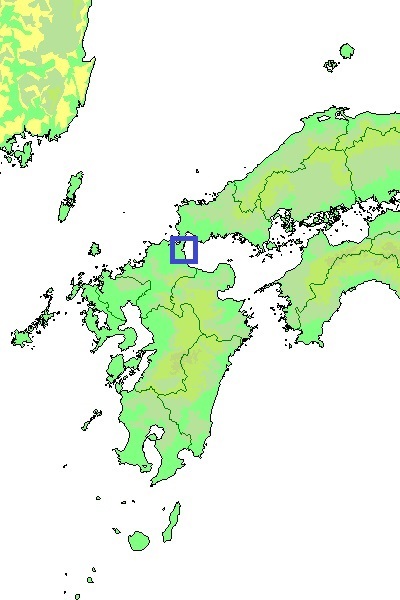 Looking at this situation, Mouri army retreated from Kyushu island except for Moji peninsula, and did not make direct battle against Otomo clan at Kyushu any more. 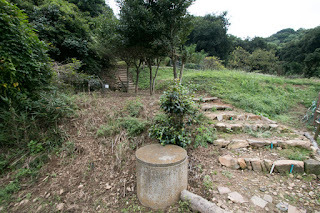 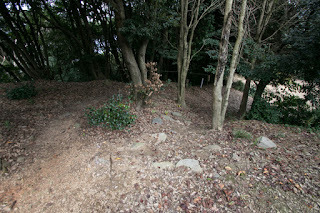 Takashige well kept Matsuyama castle with small army from overwhelming Otomo army but opened the castle and retreated at this time. 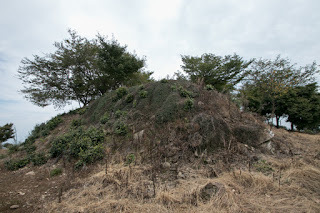 Later Takashige Amano was appointed as a commander of Gassan Toda castle (Shimane prefecture), former main base of Amago clan and important base at Sanin region, and thoroughly broke Amago clan restoration army attacked Gassan Toda castle lead by Yukimori Yamanaka (1545-1578). 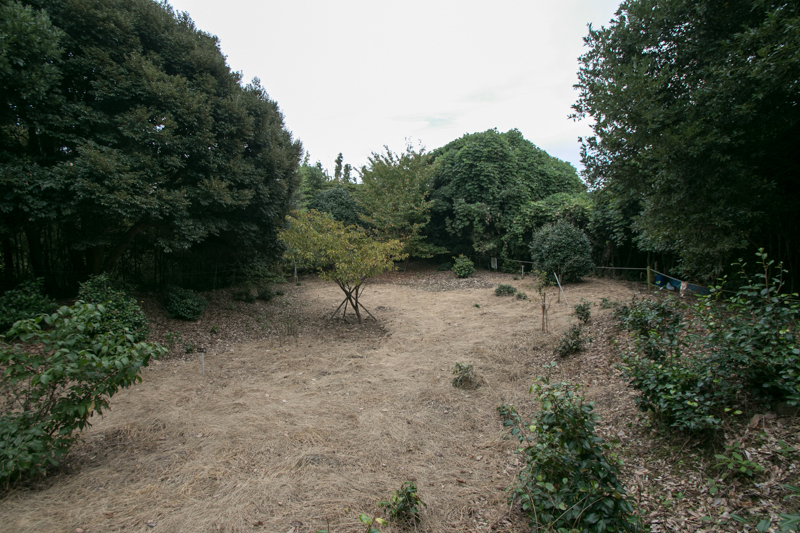 Otomo clan kept Matsuyama castle for 10 years, but significantly lost its power after the defeat at the battle of Mimikawa before Shimazu clan in 1578. Akizuki clan which was the lord of Koshosan castle and had relationship with local lords of Buzen province such as Takahashi clan or Nagano clan left Otomo clan and became independent power, and Matsuyama castle was seized by Nagano clan which stayed at Umagatake castle. Shimazu clan which broke Otomo army seemed to unite Kyushu island, but in 1586 central ruler Hideyoshi Toyotomi (1537-1598) decided to subjugate Shimazu clan and ordered his military staff Yoshitaka Kuroda (1546-1604) and Mouri clan to land to Kyushu island as a vanguard. 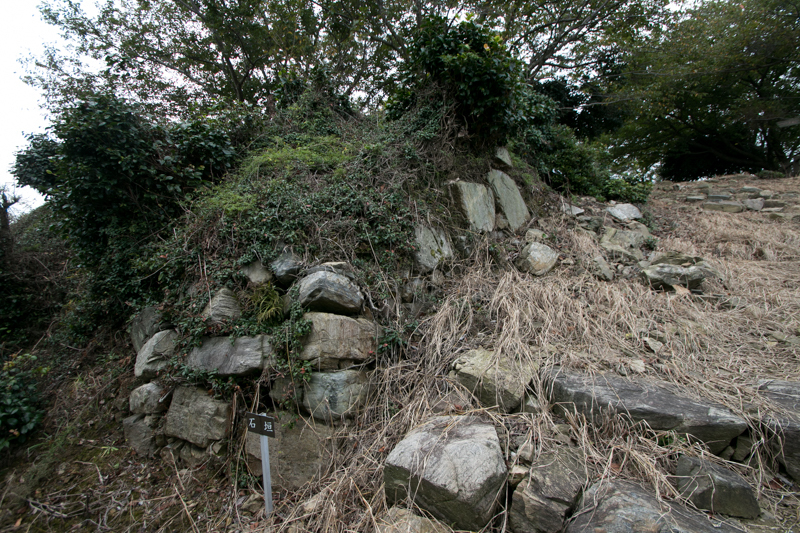 Different from their master Akizuki clan, Nagano clan surrendered to Yoshitaka then accepted him at their main base Umagatake castle. 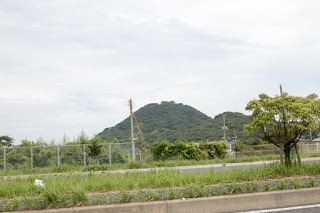 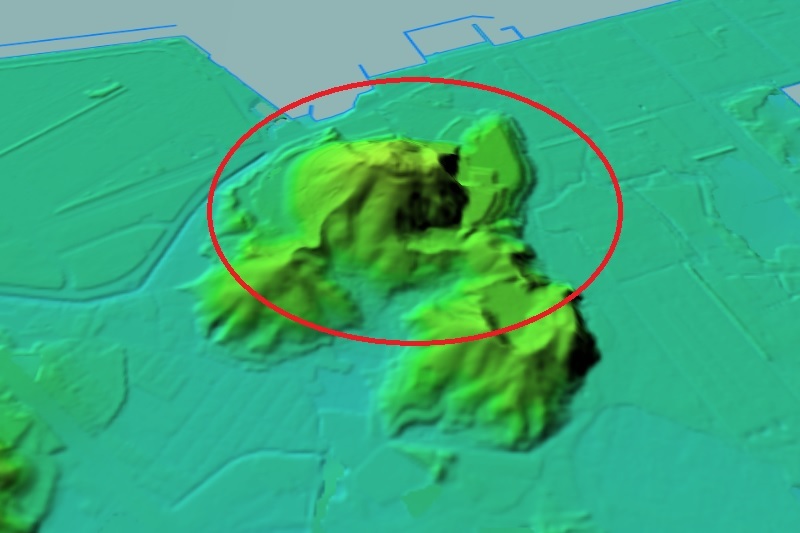 At this time under the unstable situation Yoshitaka might use Matsuyama castle as a connecting point toward Seto-Naikai sea and central area. 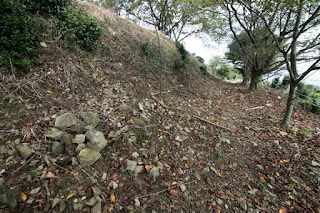 Considering old style stone walls of the castle and geographical importance, Kuroda clan might reform Matsuyama castle with stone wall at this time. 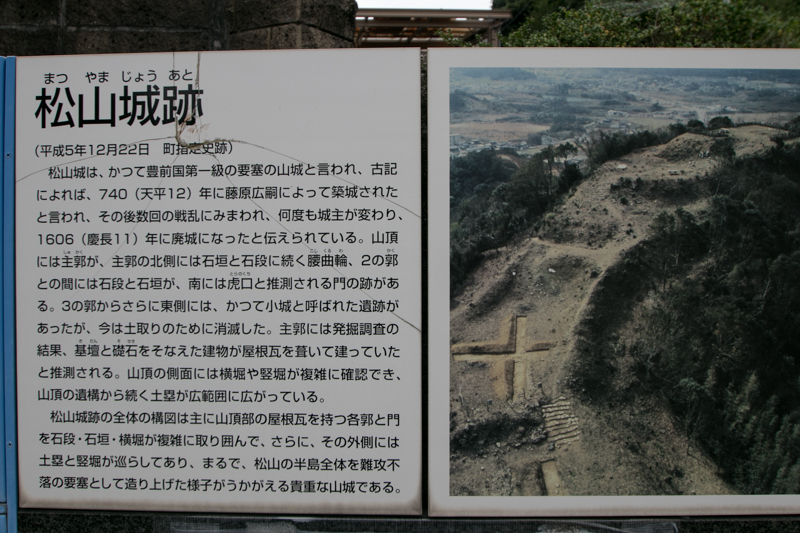 Next year Hideyoshi himself landed to Kyushu island with overwhelming army, then forced Shimazu clan and other local lords to surrender. Yoshitaka Kuroda was appointed as the lord of major part of Buzen province, then at first stayed Umagatake castle but soon built Nakatsu castle (Oita prefecture) and lived there. As Kokura castle and current Kita-Kyushu city area was held by Katsubobu Mouri (?-1611), Matsuyama castle became the border against Mouri clan. 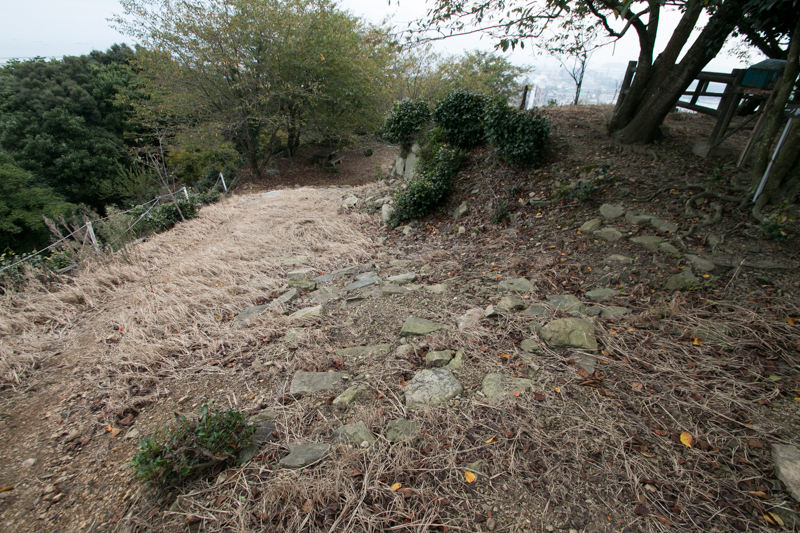 This Mouri clan was a colleague of Yoshitaka, but Kuroda clan kept Matsuyama castle as an important border castle. 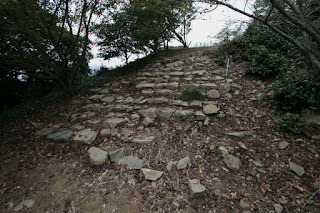 Core part of Matsuyama castle is about 150 meter long spread from east and westward. 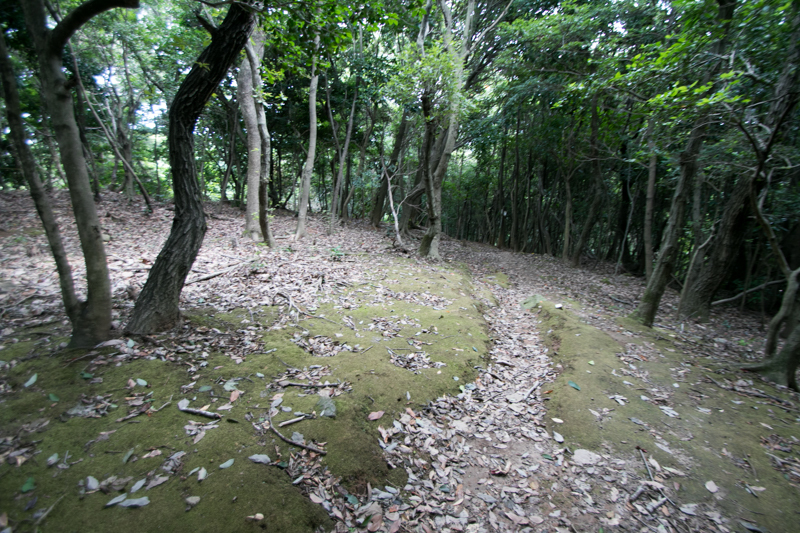 Central area of the castle is a rectangular flat space of 30 meter long and 20 meter wide. 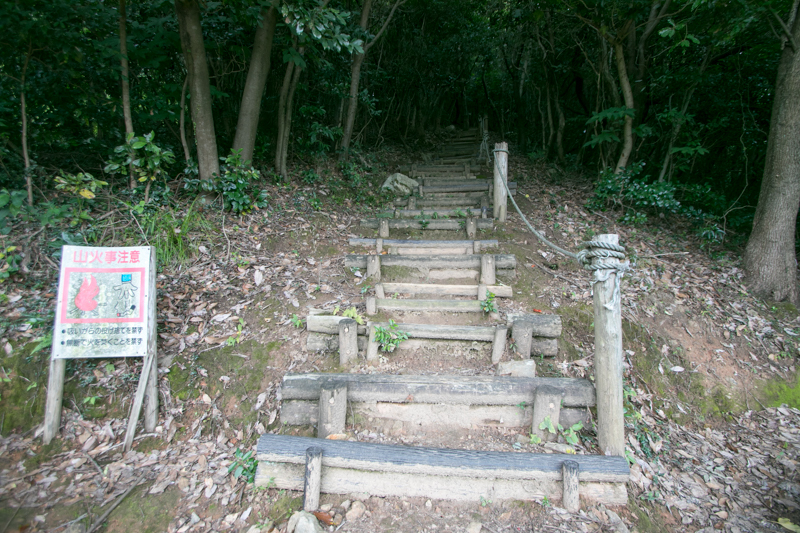 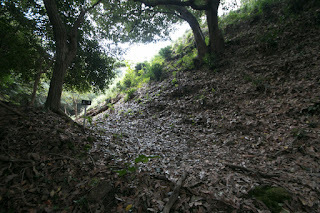 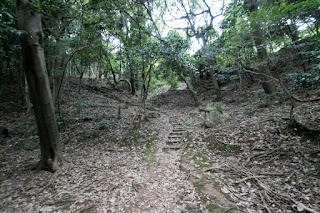 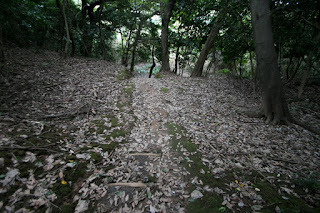 At the east of the area there is a main entrance of this area, which is a 10 meter wide stone step. 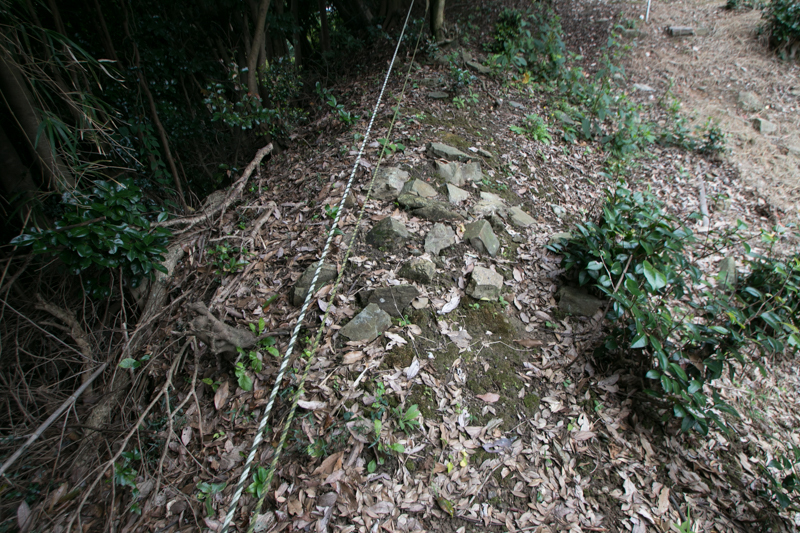 The side of this step is a projection covered by stone wall, and there might be a main tower of this castle. 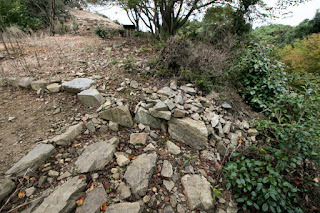 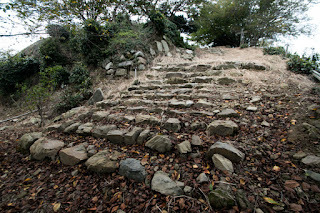 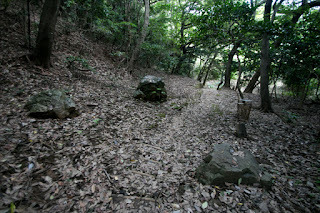 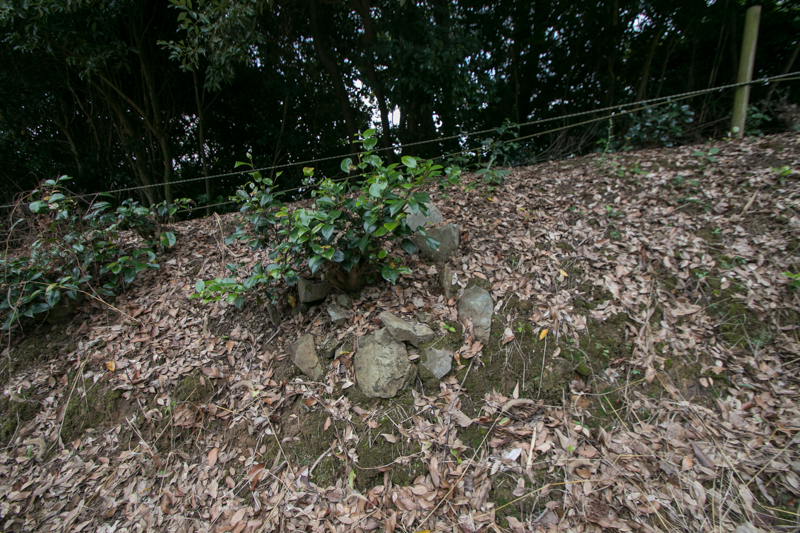 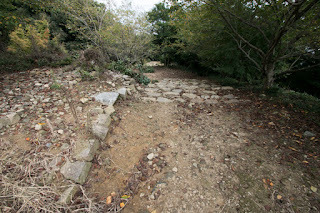 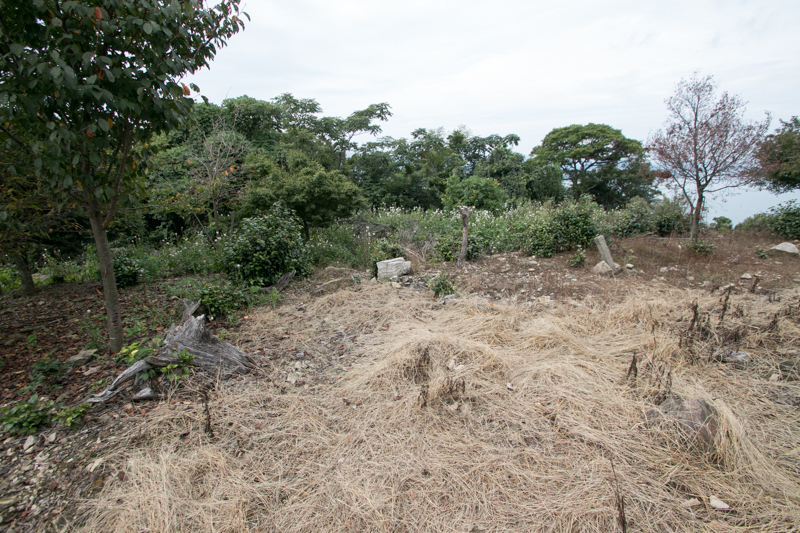 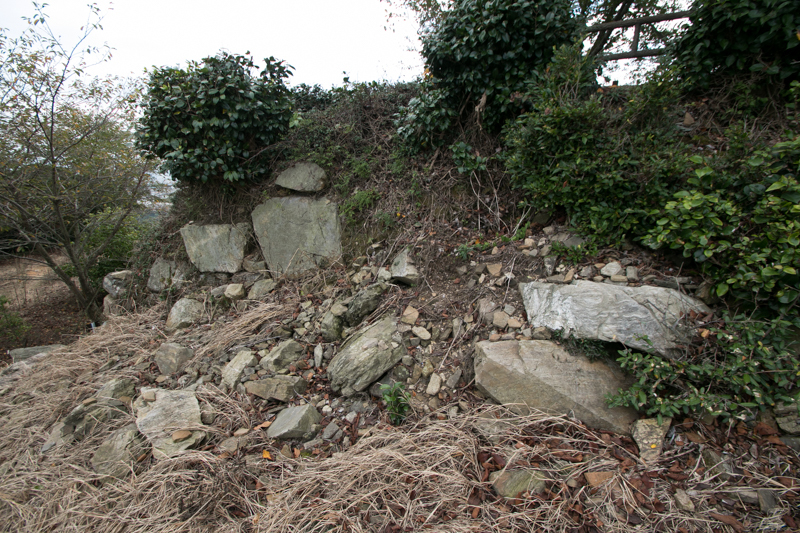 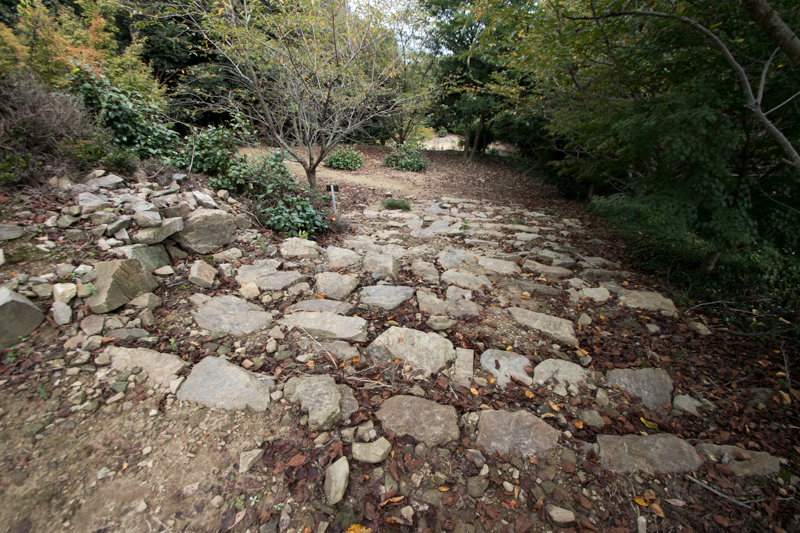 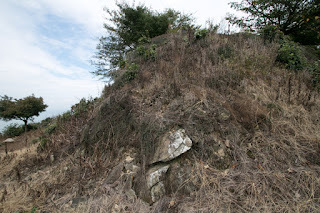 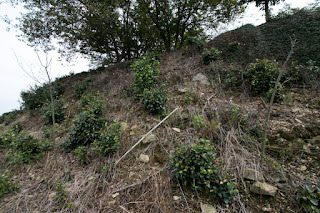 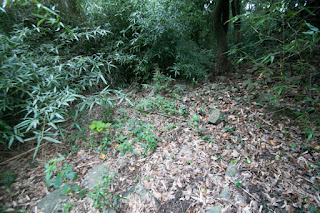 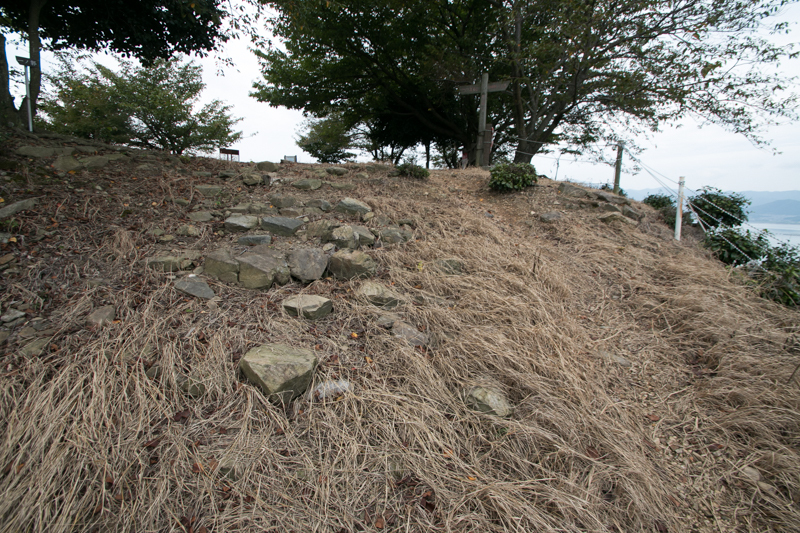 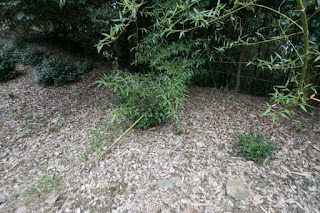 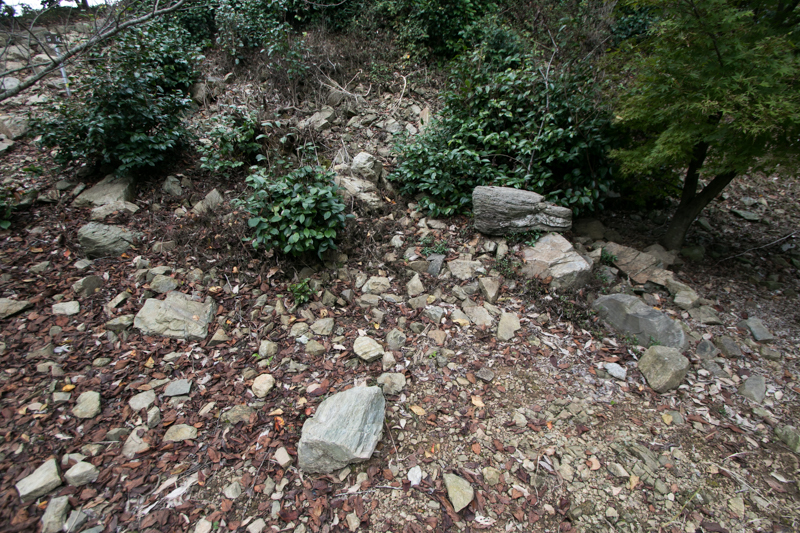 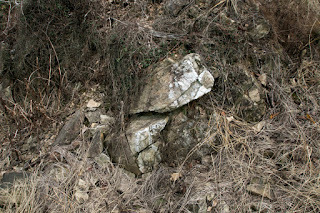 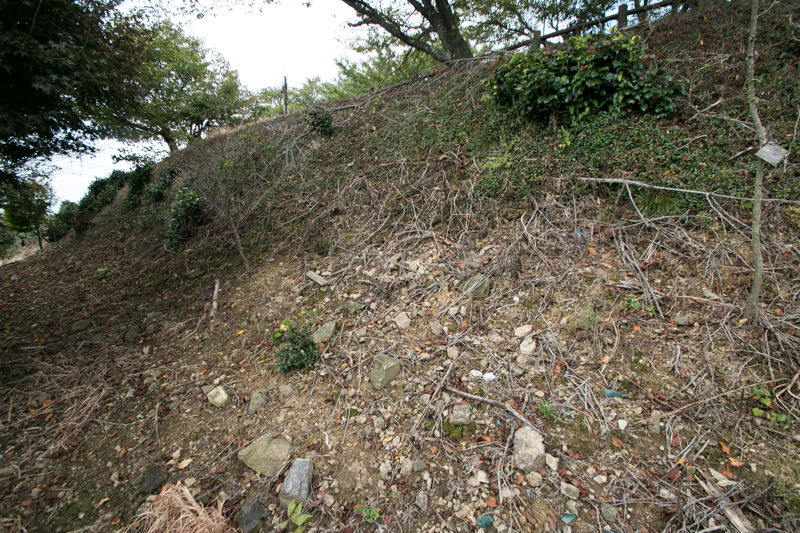 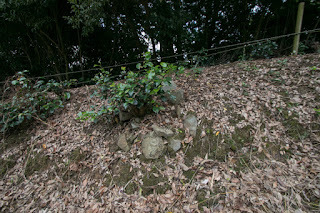 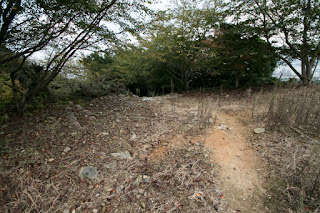 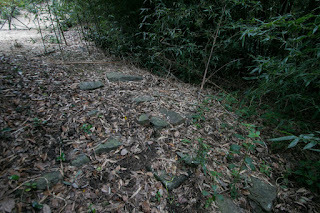 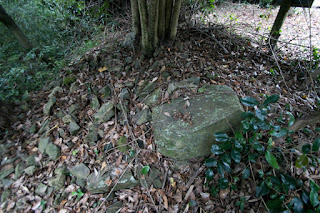 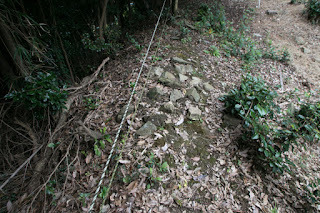 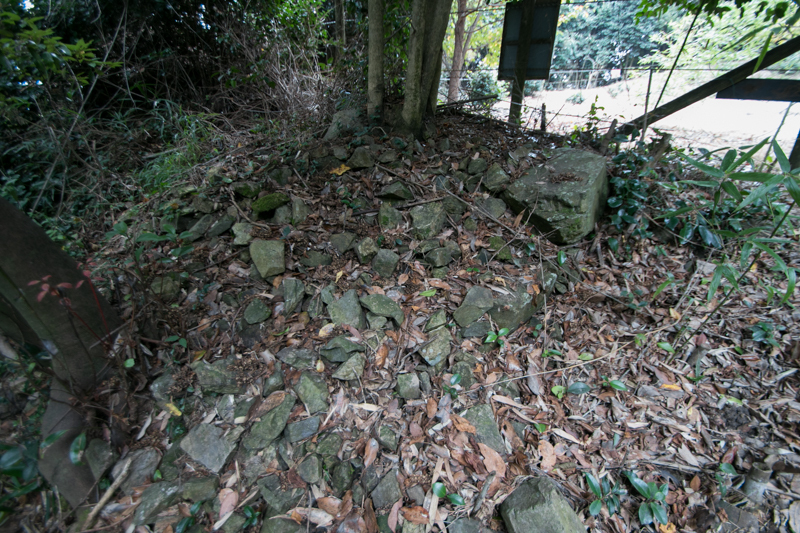 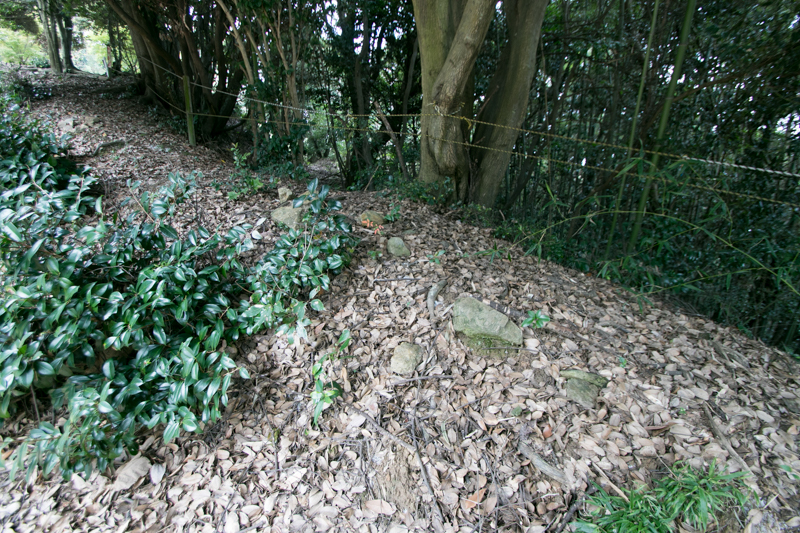 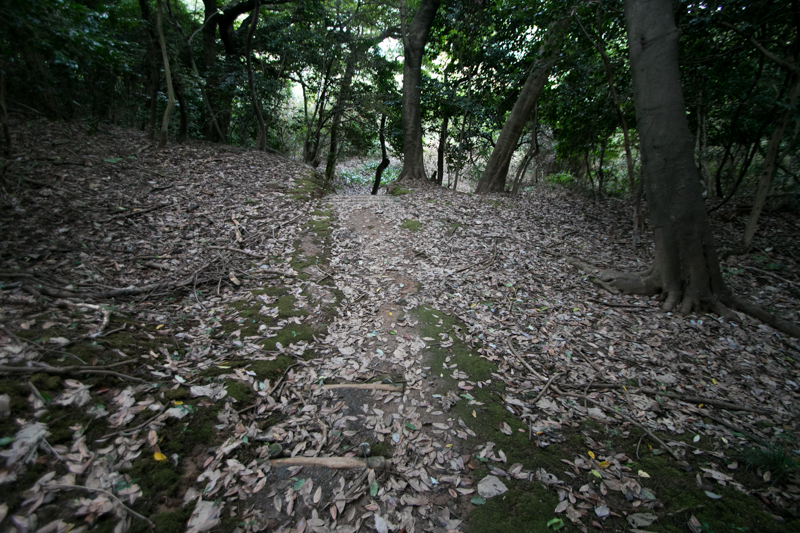 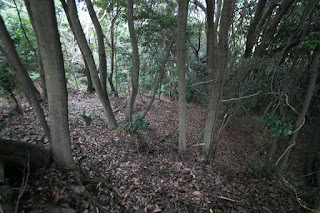 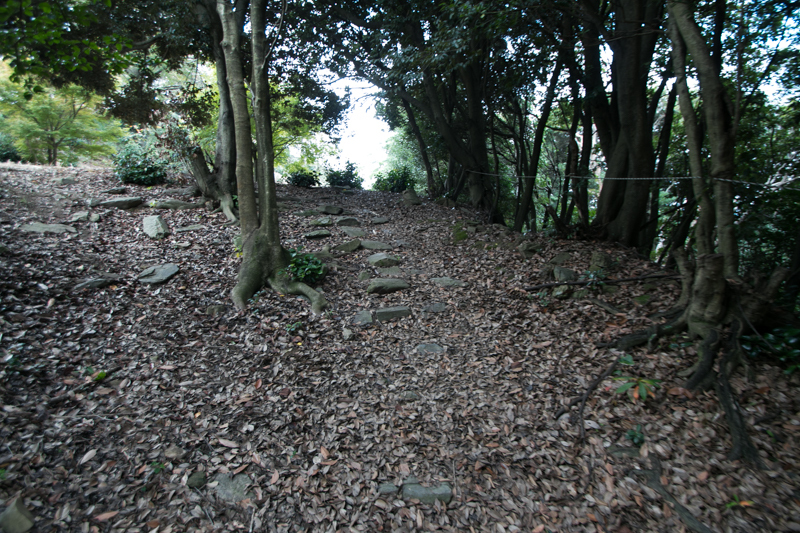 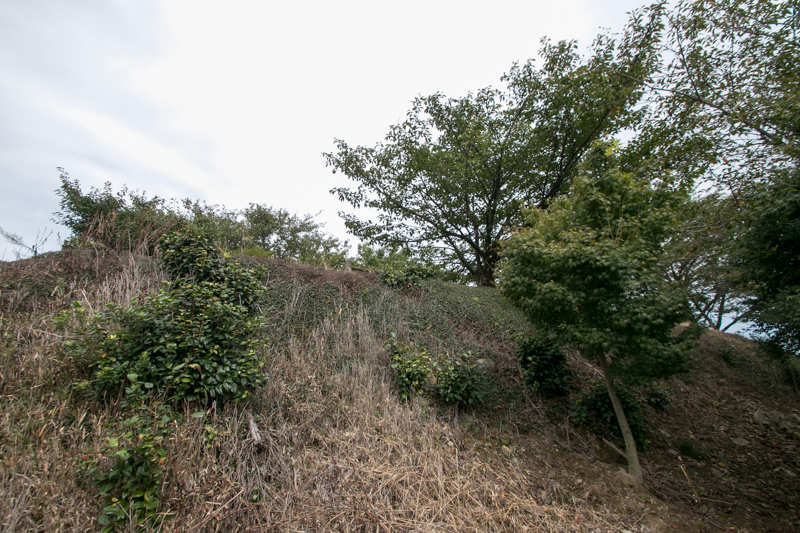 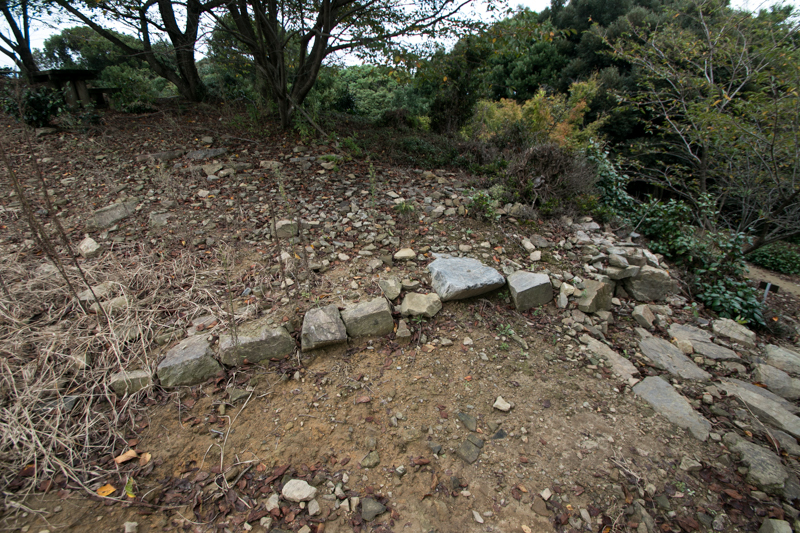 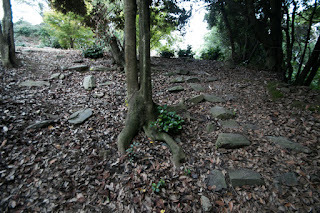 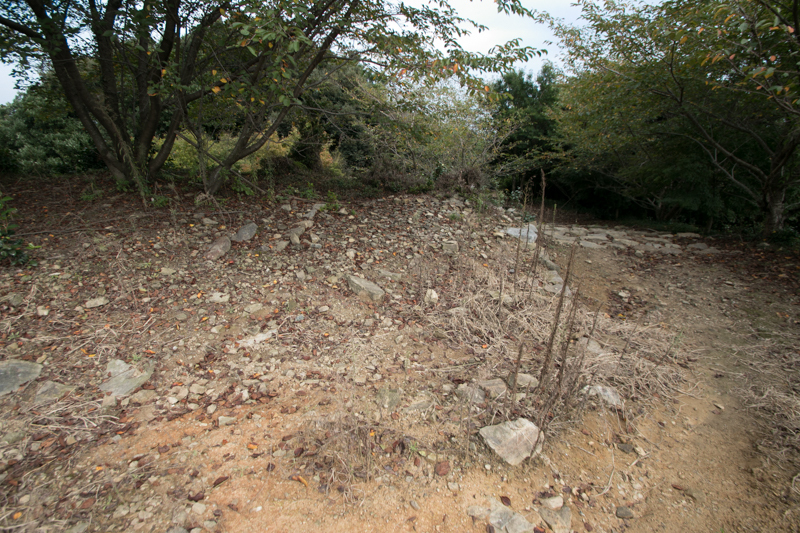 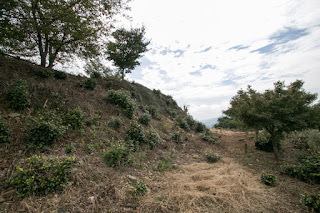 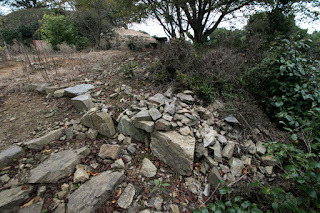 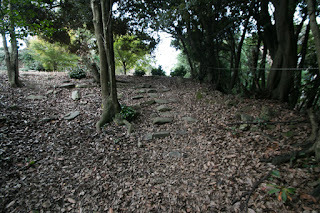 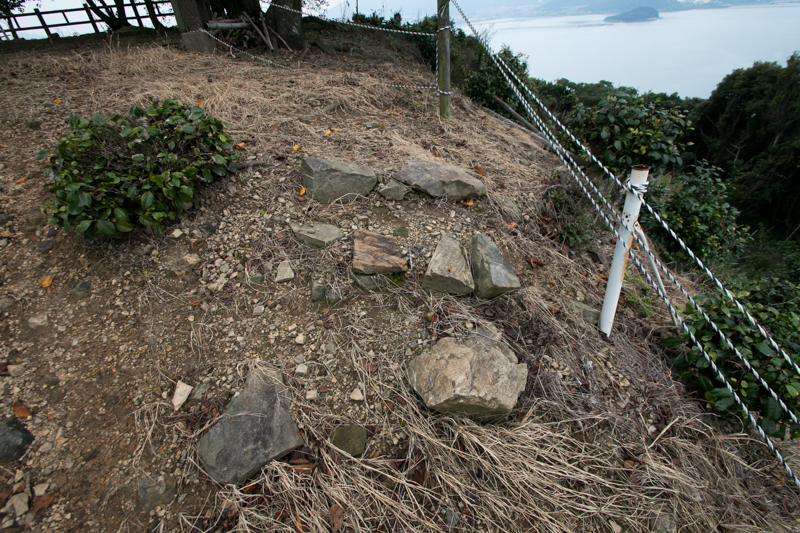 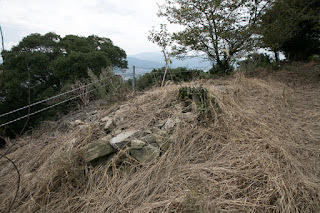 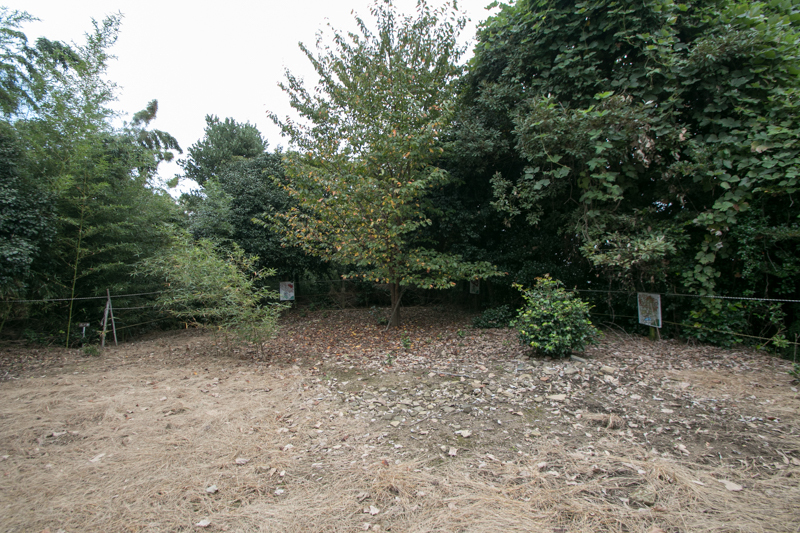 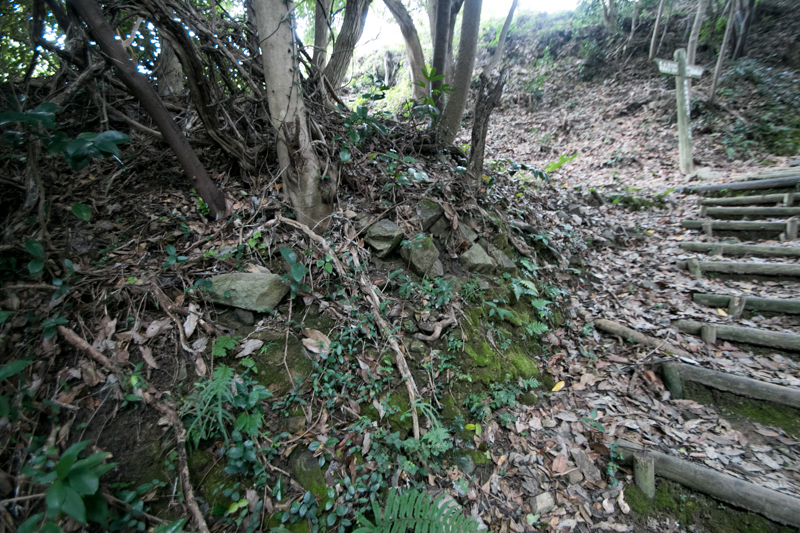 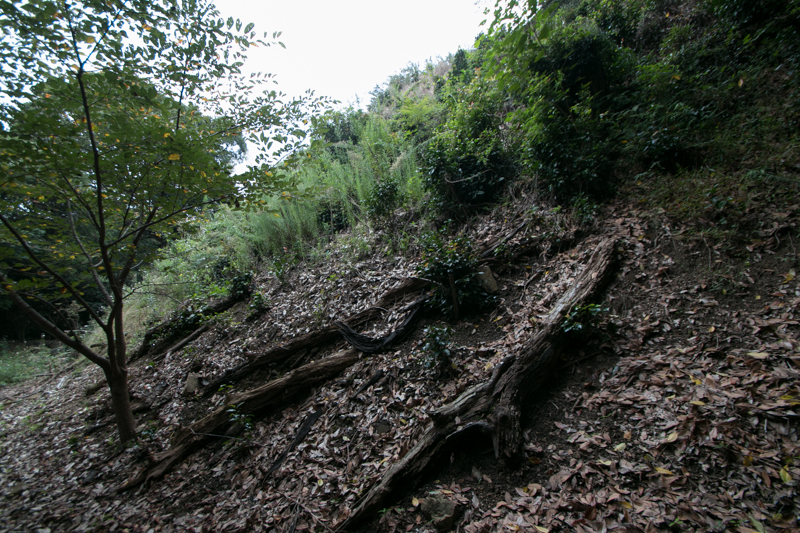 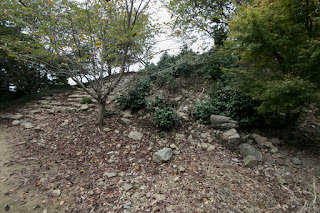 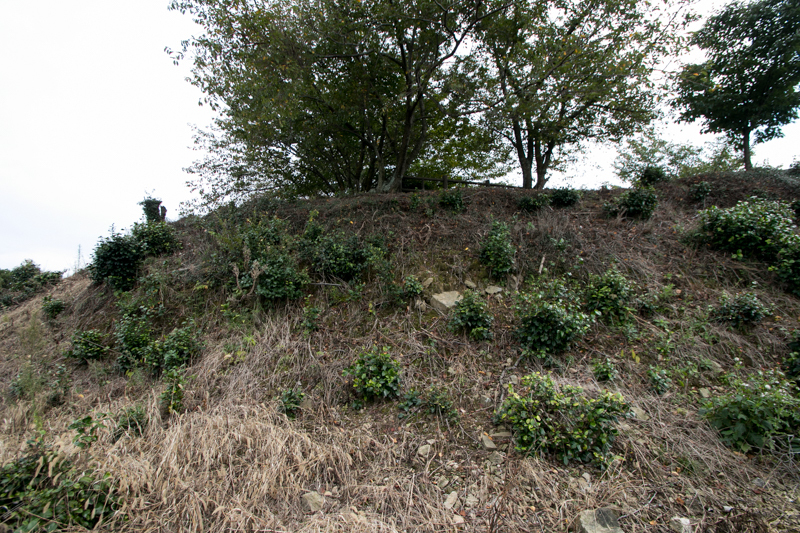 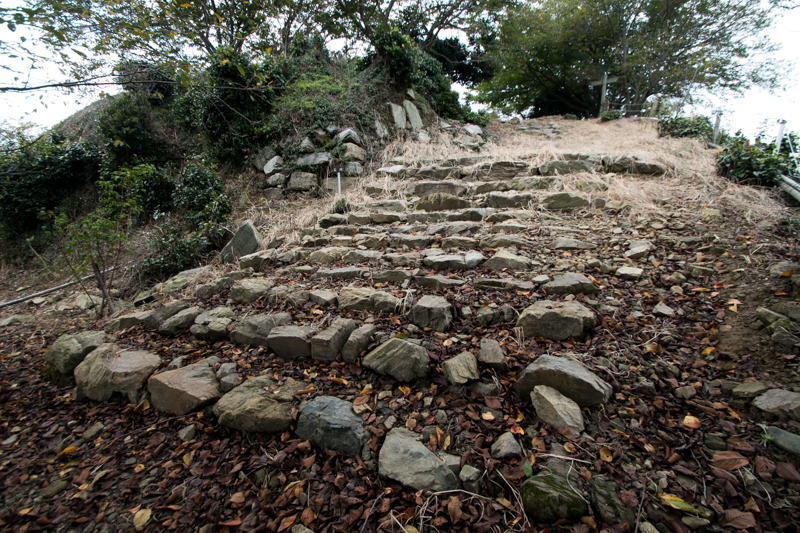 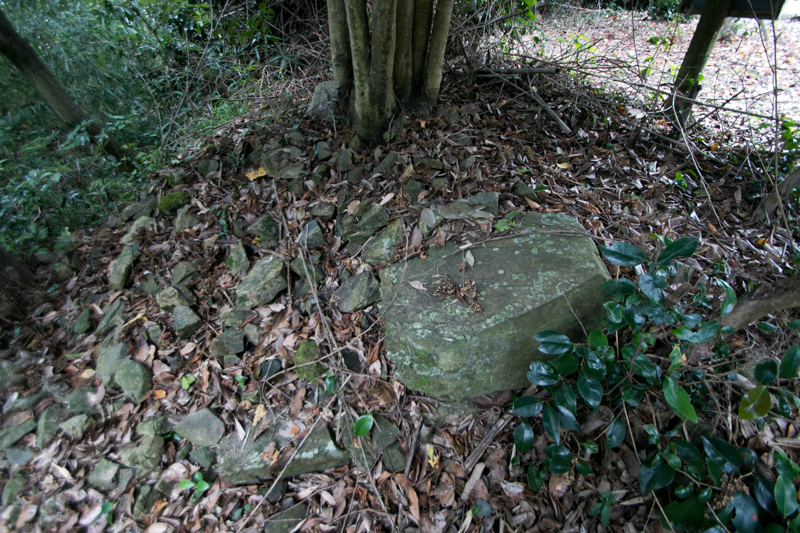 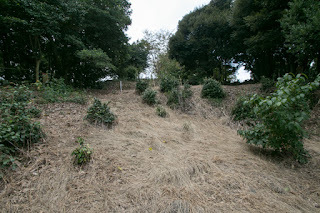 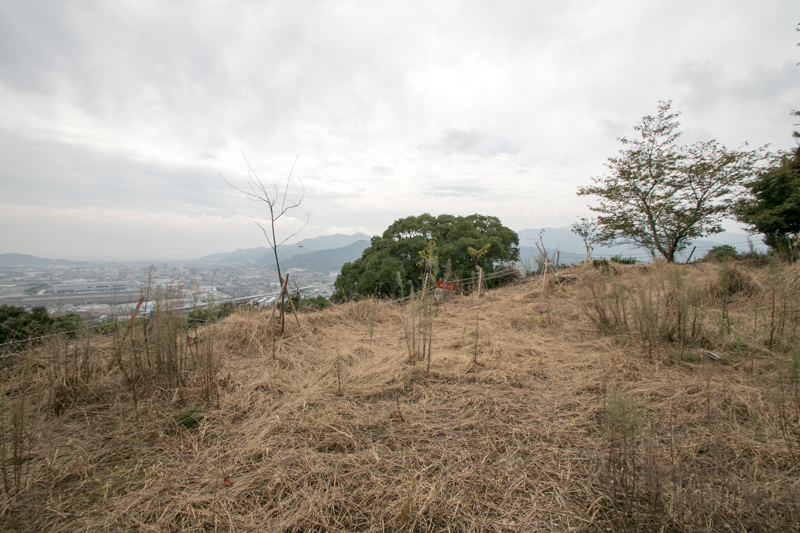 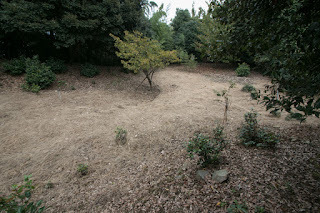 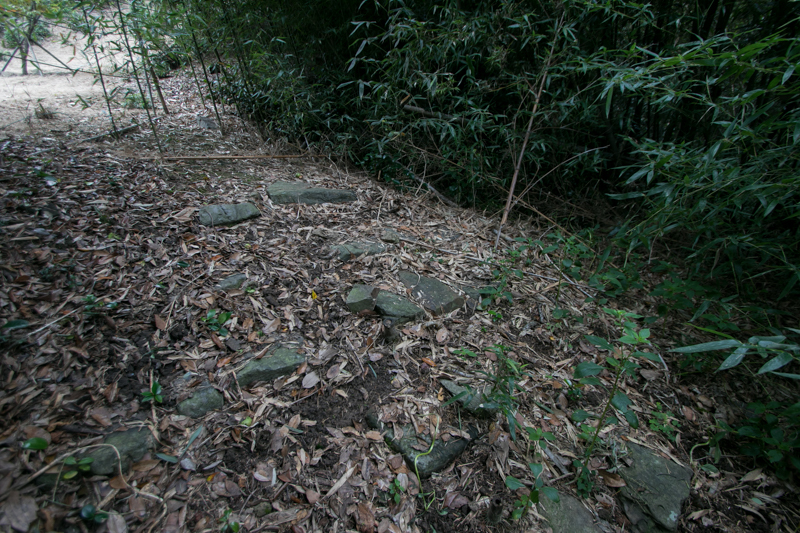 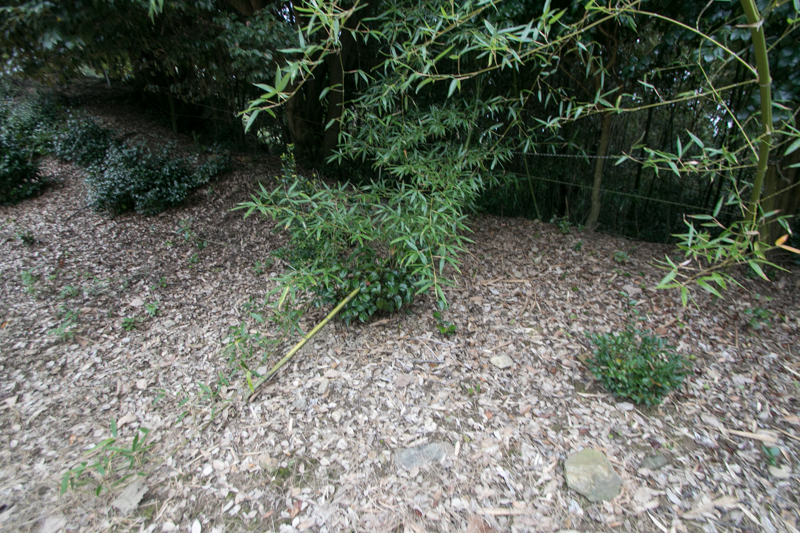 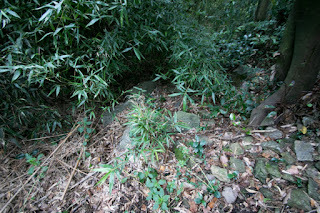 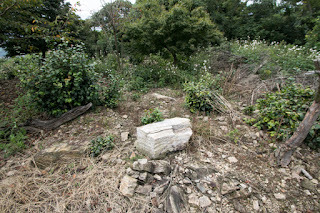 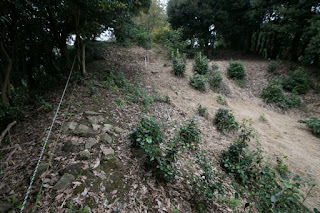 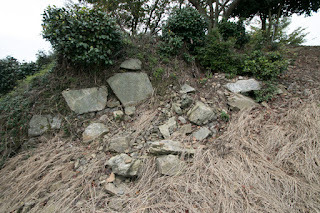 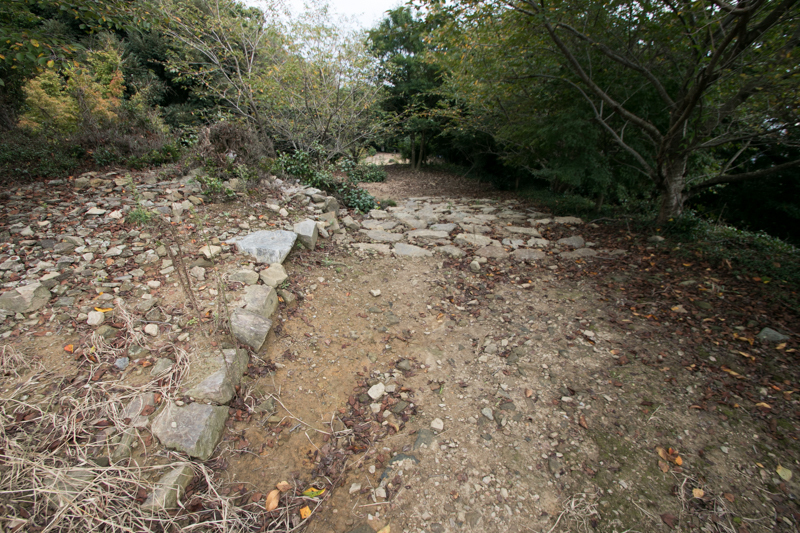 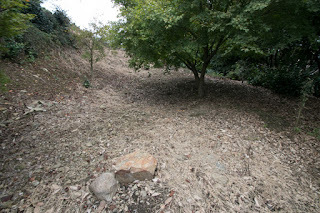 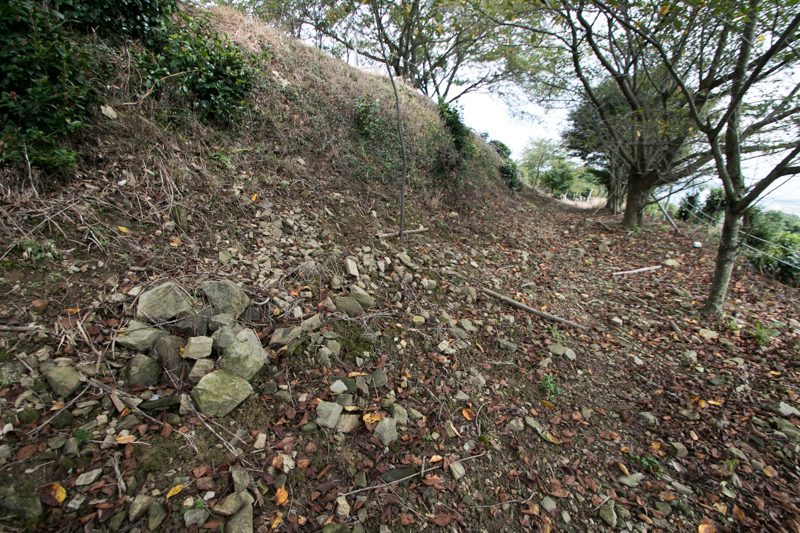 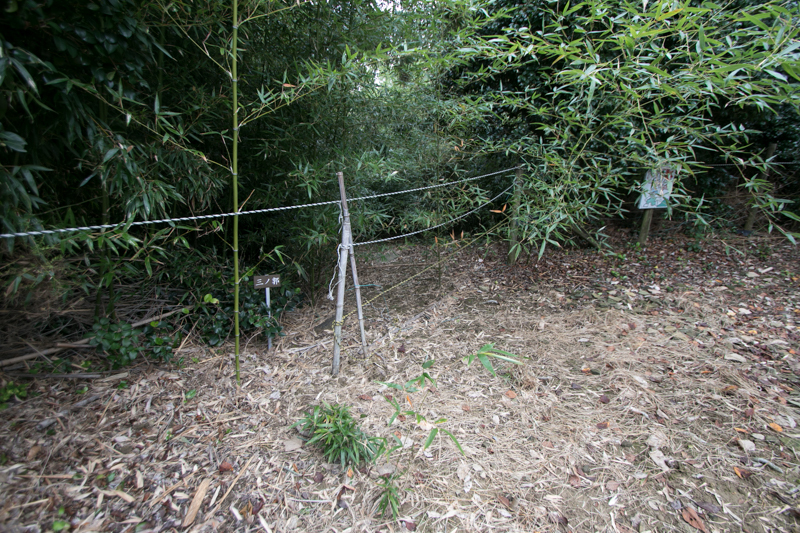 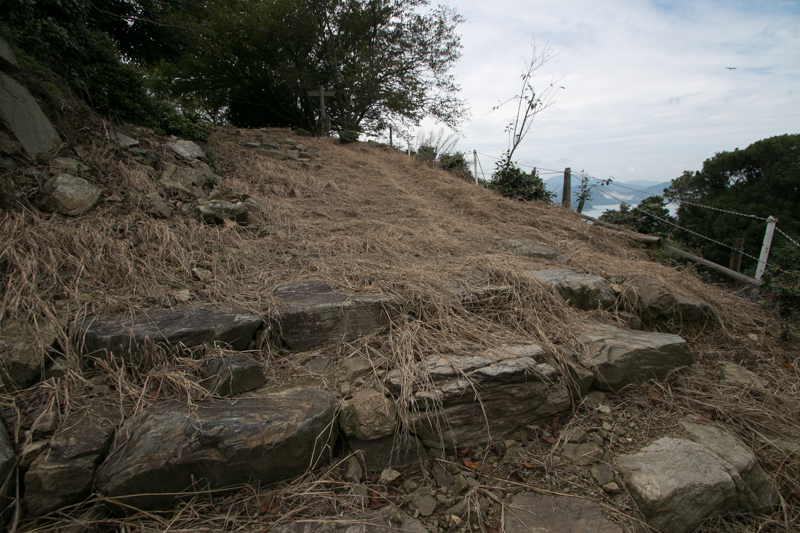 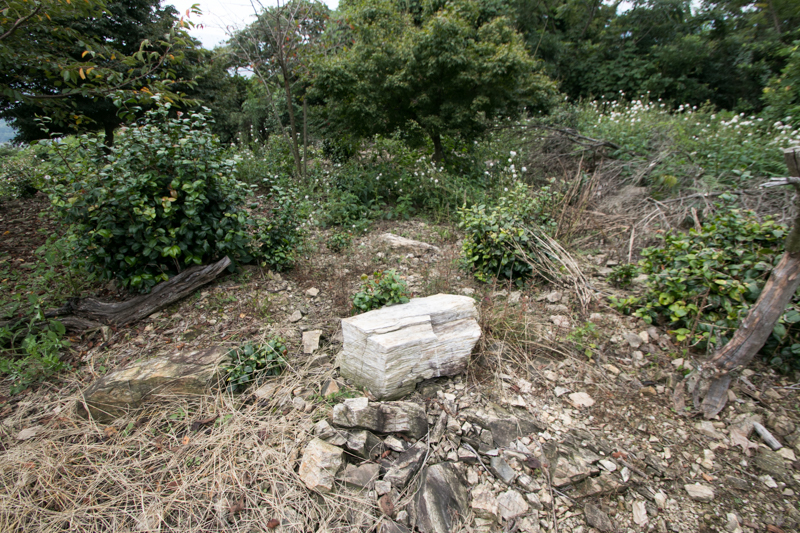 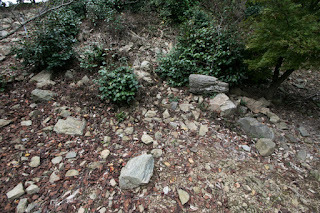 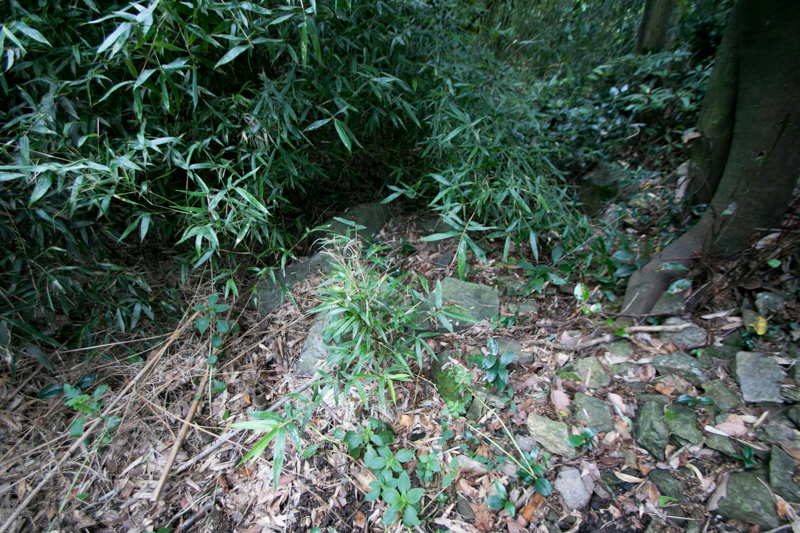 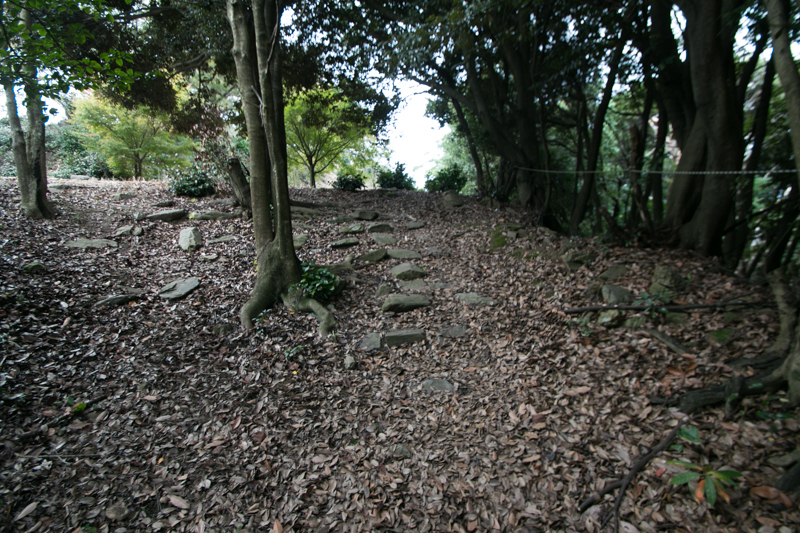 The backside slope of central area has a remnant of stones, and originally whole part of central area might have stone walls. 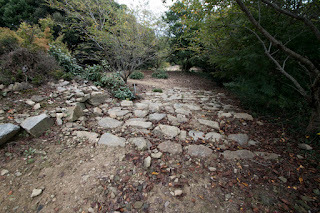 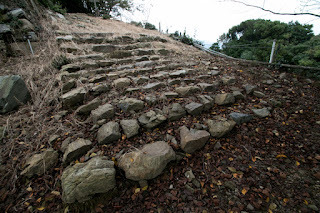 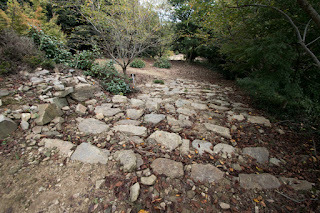 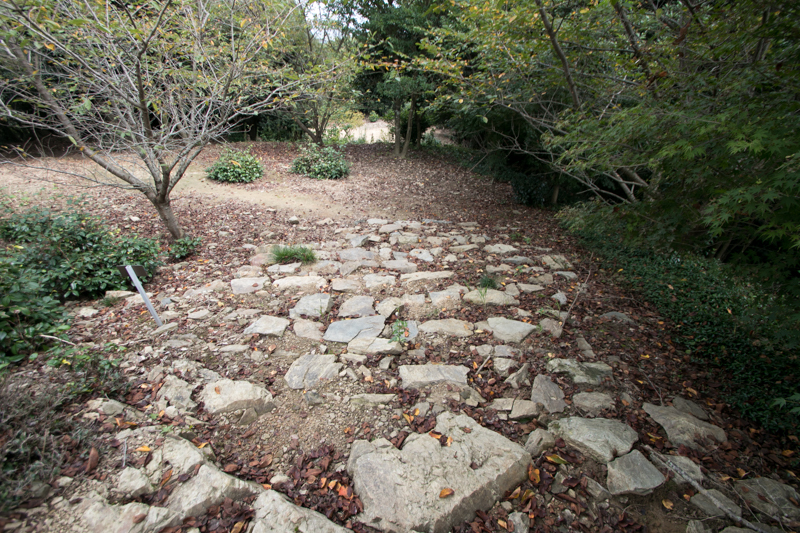 At the east of this central area there are two small terraces, also equips stone built steps as their entrance. 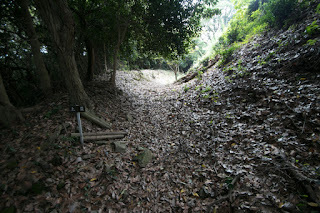 These roads are folded and placed for alternate place, both for protection and dignity. 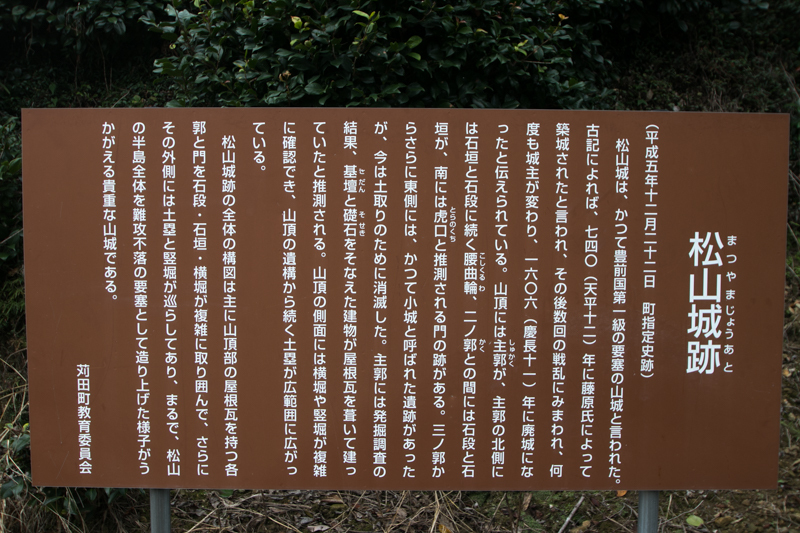 After the death of Hideyoshi in 1598, the battle of Sekigahara between Ieyasu Tokugawa (1543-1616), the largest lord under Toyotomi government and Mitsunari Ishida (1560-1600), the chief government staff occurred. 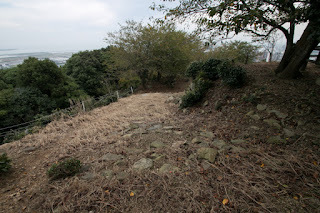 At this battle Kuroda clan belonged to Ieyasu but Katsunobu Mouri supported Mitsunari. Yoshitaka Kuroda placed his important general Kagenobu Kinugasa (1547-1631) at Matsuyama castle. 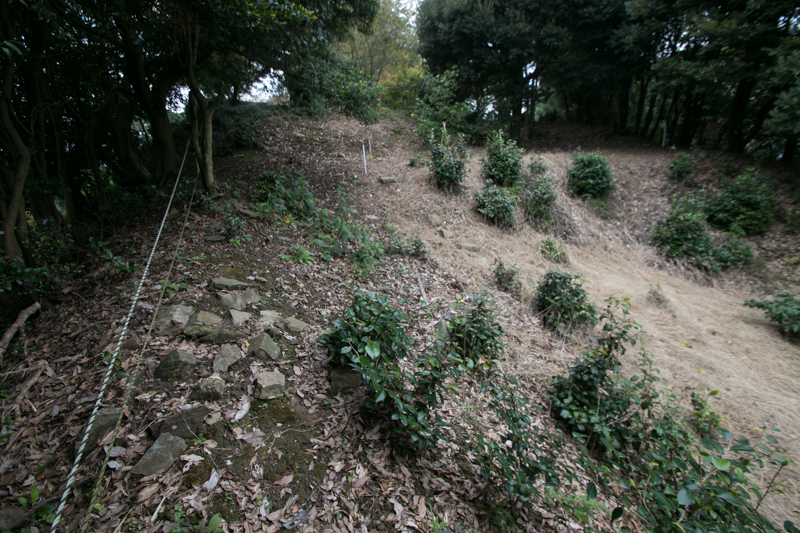 As a result there was no battle at this time, and Katsunobu Mouri lost his territory. 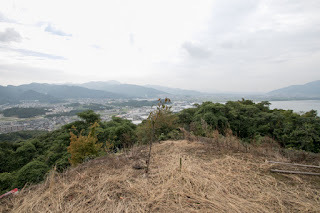 After the battle Kuroda clan moved to Chikuzen provine (western half of Fukuoka prefecture), and Hosokawa clan became the lord of Kokura castle and Nakatsu castle. 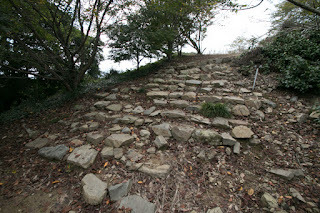 Hosokawa clan kept Matsuyama castle for a while, but Matsuyama castle was not a border any more as Hosokawa clan held both of Kokura area and Nakatsu area. In 1606 Hosokawa clan abolished Matsuyama castle, but kept it as a property of the domain. Now all building was lost but structure of the castle well remain over the hill, along with magnificent stone built steps. 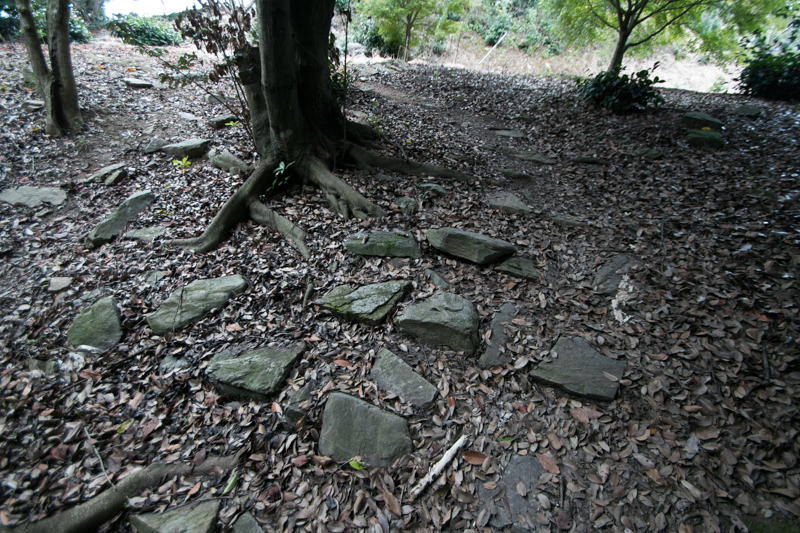 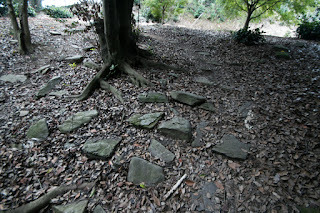 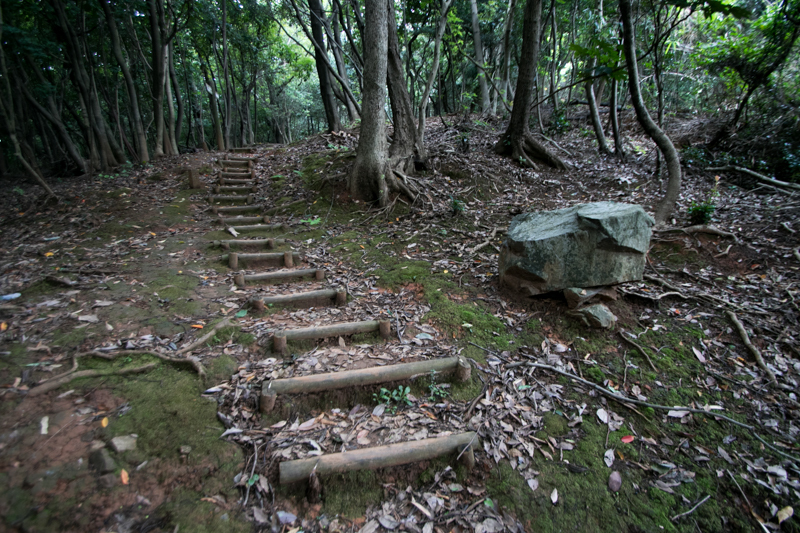 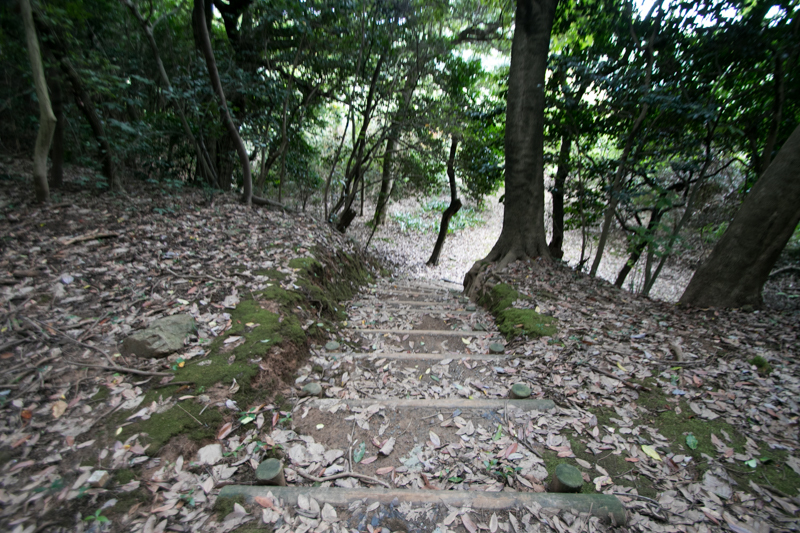 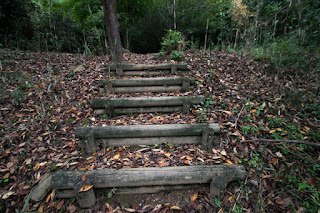 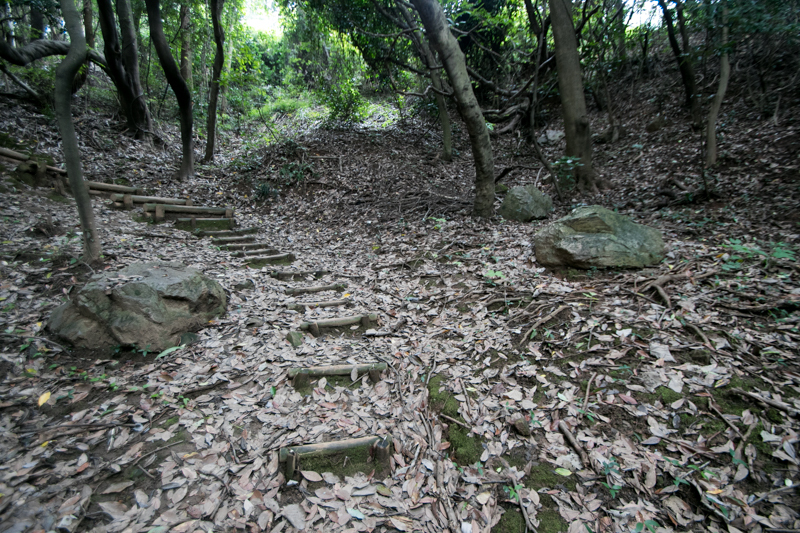 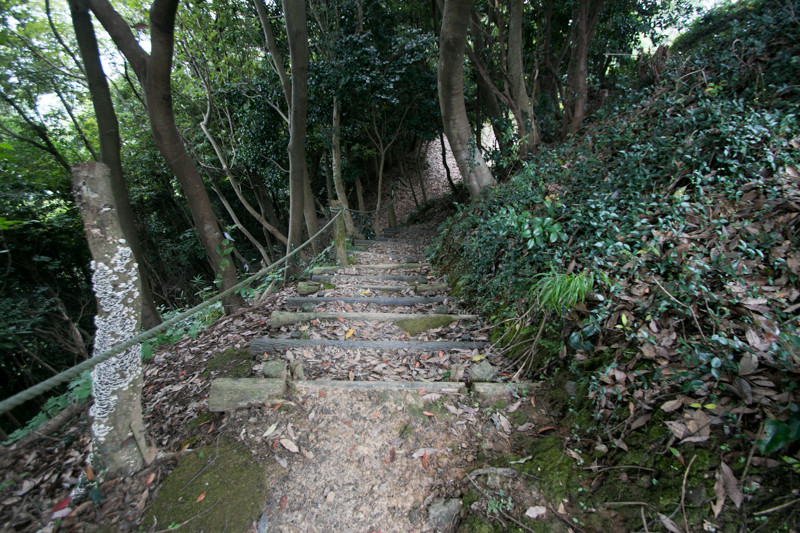 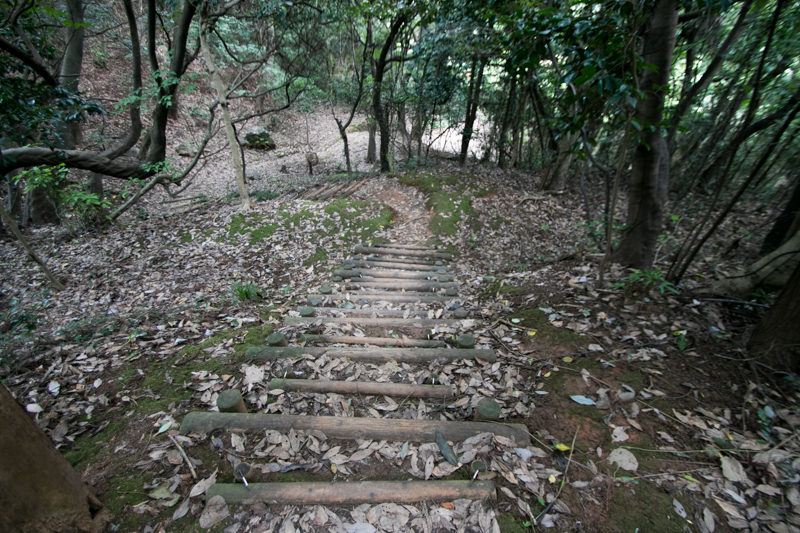 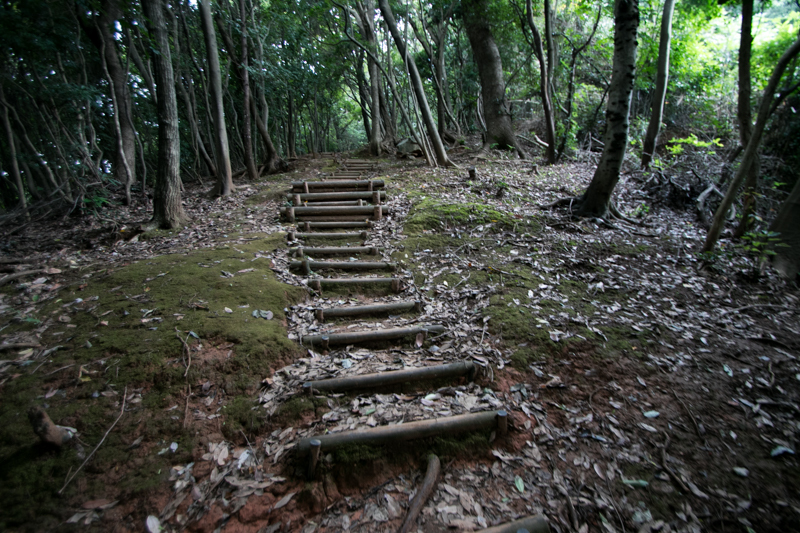 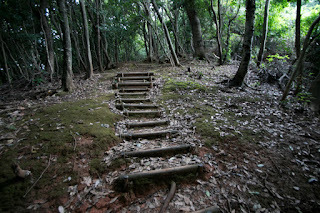 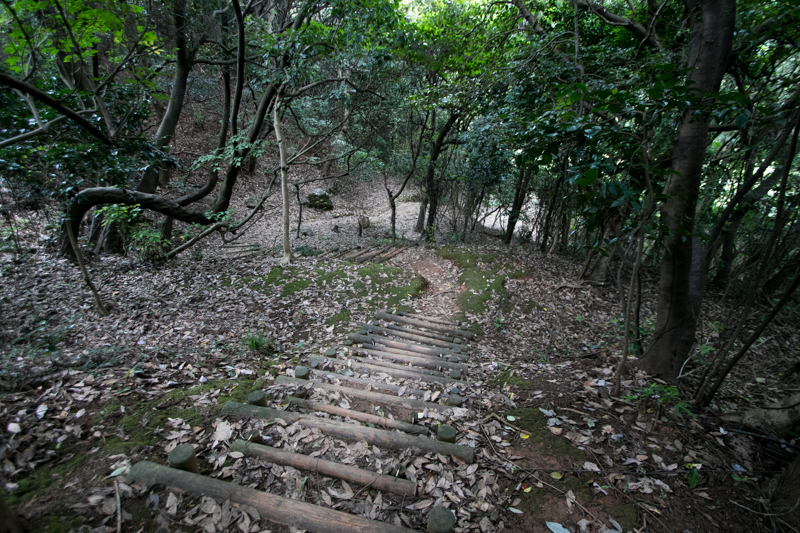 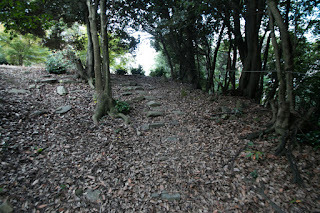 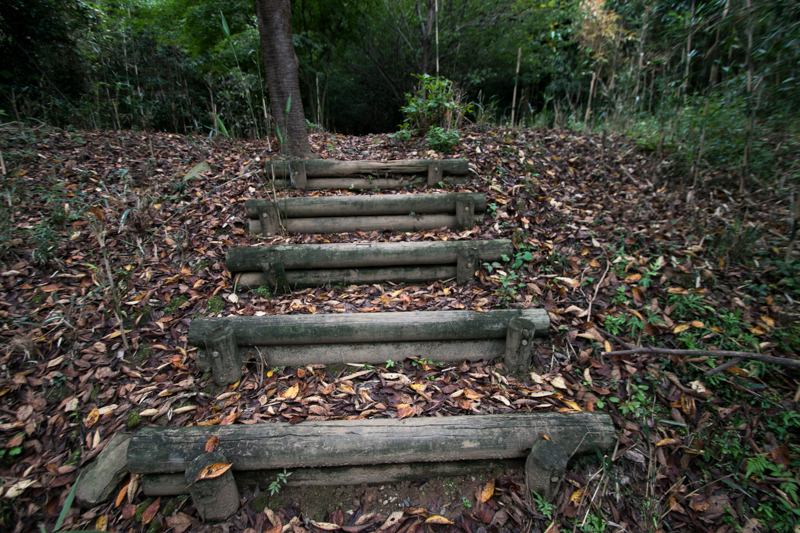 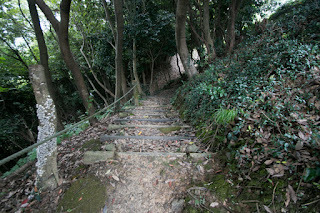 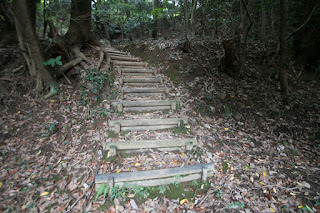 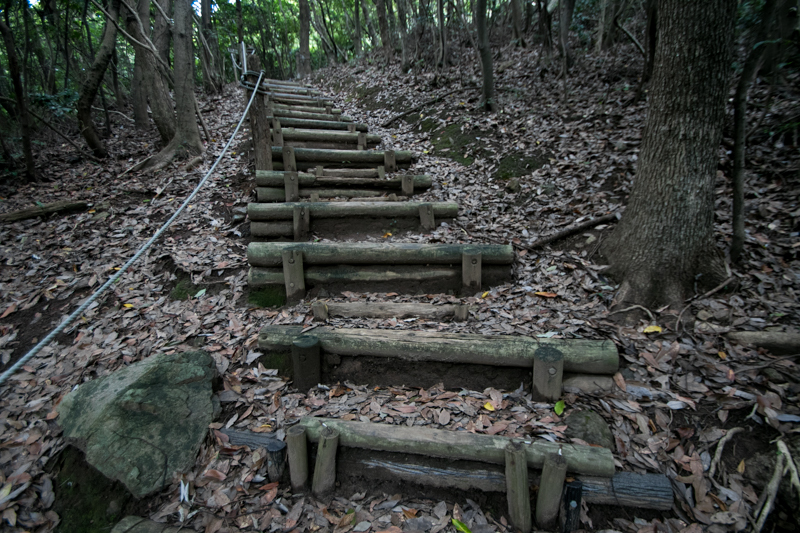 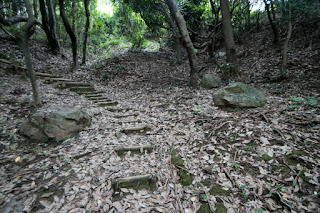 In spite of its small size, only stone step has a powerful impression equivalent to larger castle. 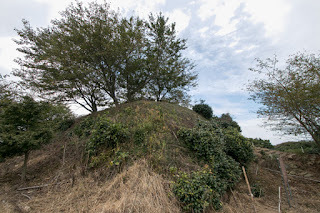 It might be built to show the dignity of central ruler and his military staff toward local lords, same as their predecessor used this castle as a standing point of outsiders. 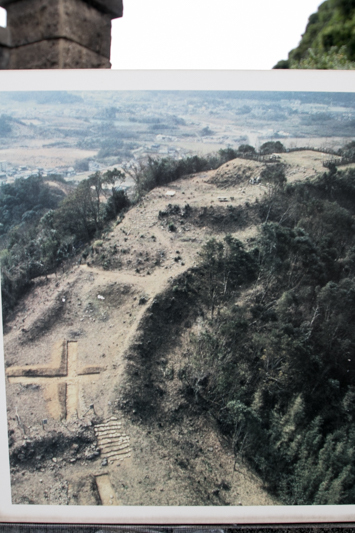 Now castle ruin looks arrival of outsiders to Kita Kyushu airport just built at offshore of castle. 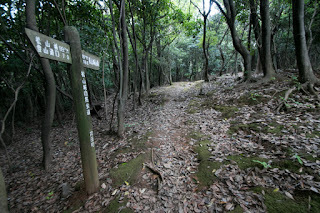 30 minutes walk from JR Kyushu Nippo Honsen line Karita station. 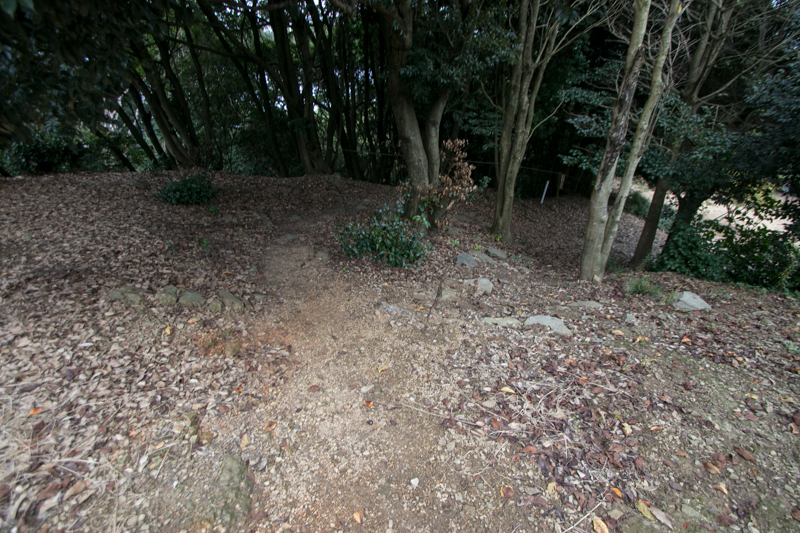 15 minutes drive from Higashi Kyushu Jidoshado Expressway Karita Kita-Kyushu Airport interchange.